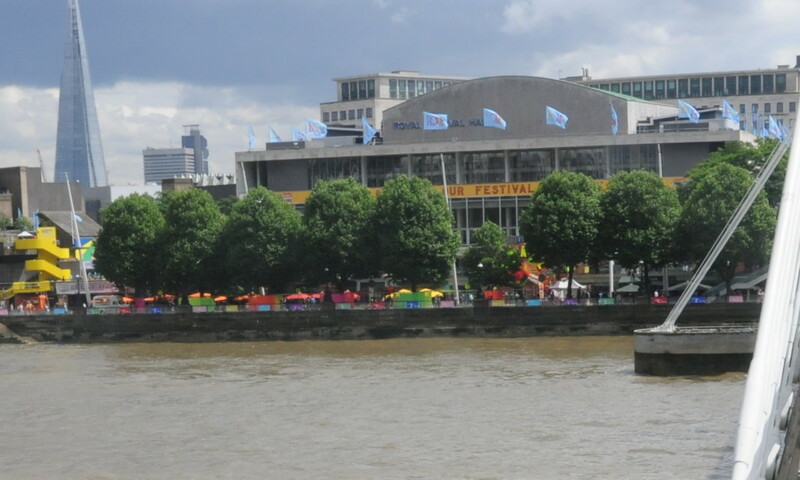 Following the walk round the Upstream Circuit of the Festival of Britain on the South Bank, in this post I will take a walk round the Downstream Circuit – The People, however first a couple of other aspects of the festival. 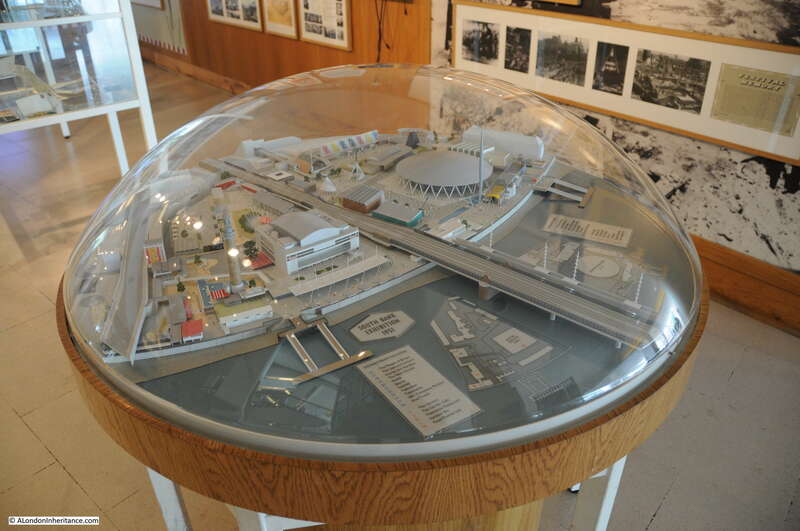 There is a small display in the Royal Festival Hall covering the Festival of Britain. This display includes a superb model of the overall festival site showing all the major landmarks of the festival, pavilions and Thames piers. If you visit the Royal Festival Hall, please do take a look. I mentioned in my last post on the use of colour across the festival site after long years of war and austerity. As well as colour, the festival was very brightly lit after dark, which again was a major attraction for visitors given that nothing had been this brightly lit for many years. The following photos show how good the South Bank site must have looked after dark. 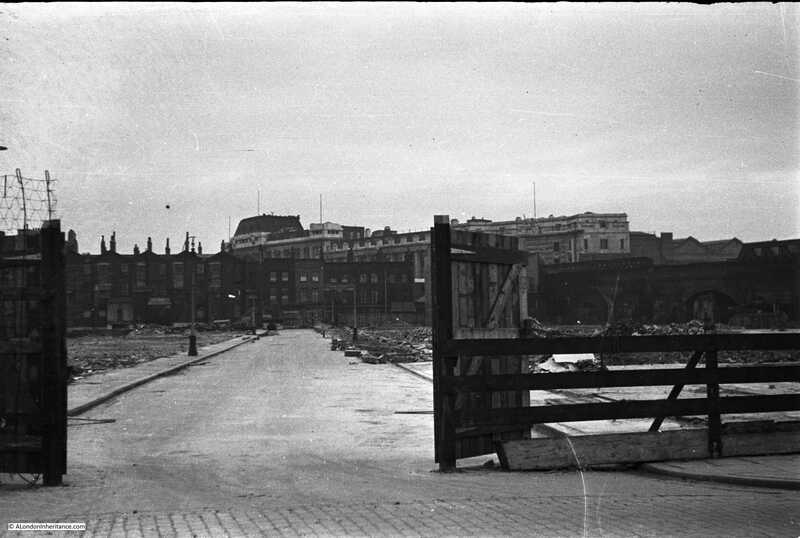 The first photo is looking towards the Station Gate from the embankment. On the left, the side of Waterloo Station is lit, then the arches over the Station Gate entrance, followed by the screen which separated York Road from the festival site, then the Dome of Discovery. In the foreground are the Fairway Fountains. This photo is looking at the Transport Pavilion. From the north bank of the river looking across to the festival site. The brightly lit Skylon is in the centre of the photo, Royal Festival Hall to the left followed by the Shot Tower. 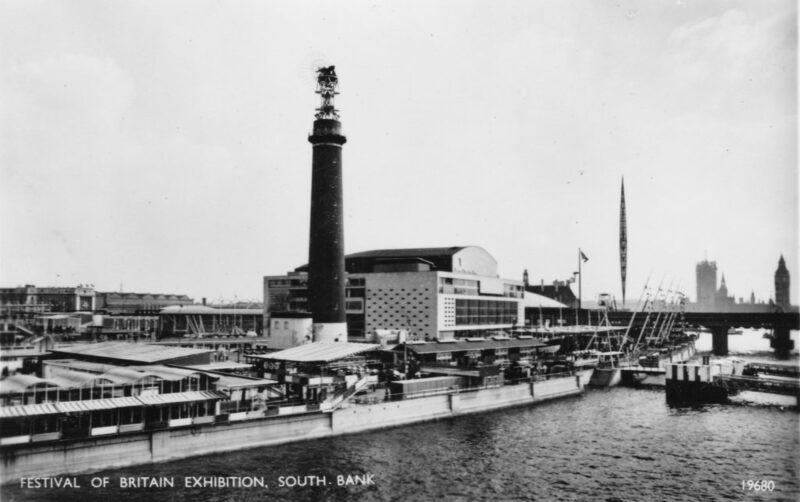 The Royal Festival Hall and the Shot Tower. 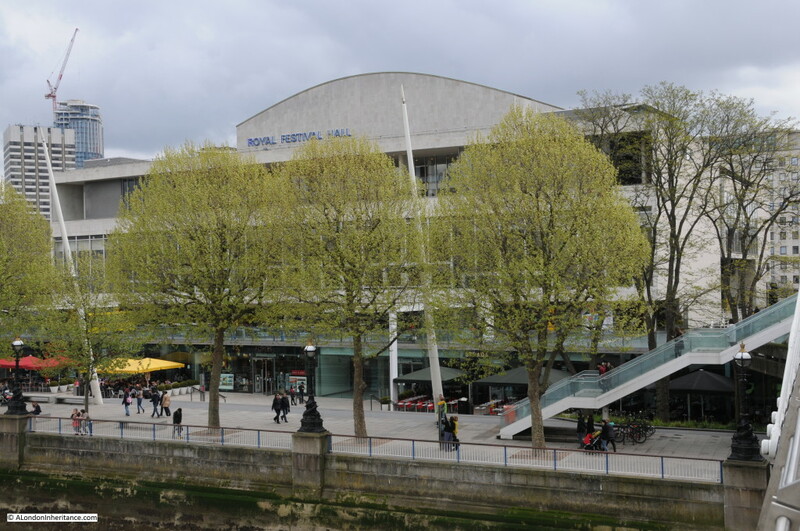 A colour view of the Royal Festival Hall with the Skylon in the background. 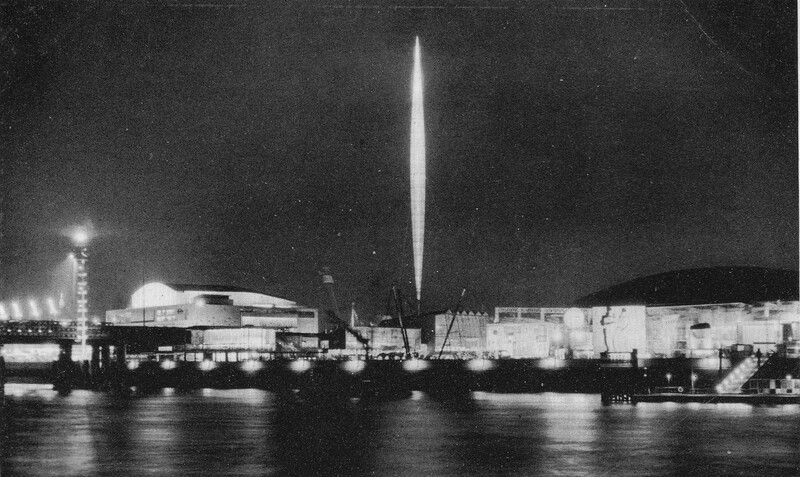 It was not just the South Bank site that was illuminated. 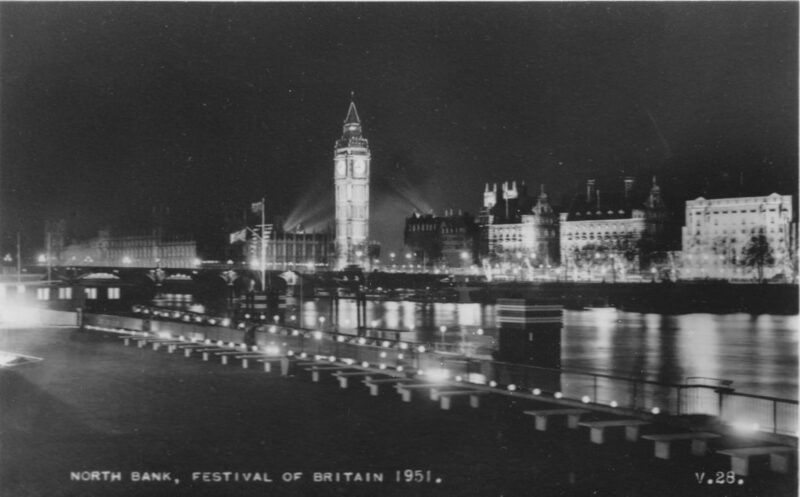 Surrounding buildings were as well, as this photo shows, with floodlit buildings along the north bank of the river, including the Houses of Parliament. 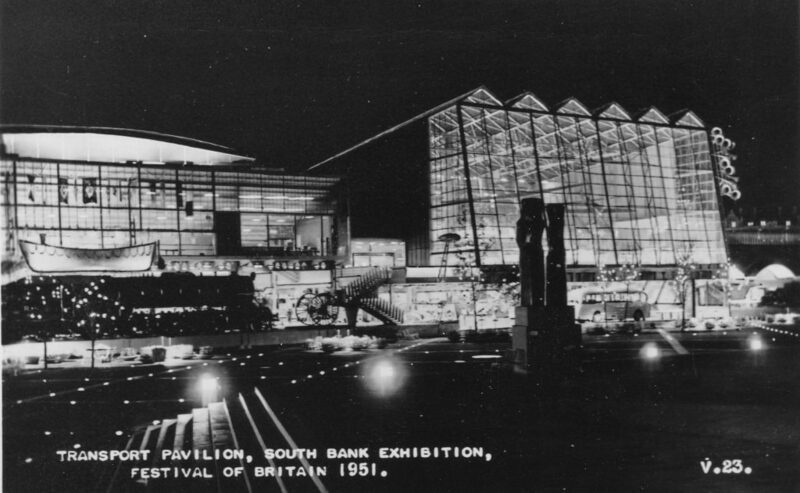 As well as the information and products displayed in each of the pavilions, the use of colour and lighting during the Festival of Britain after so many years of war, austerity and rationing aimed to inspire visitors to the festival with optimism and that there was a much better future ahead for the people of Great Britain. 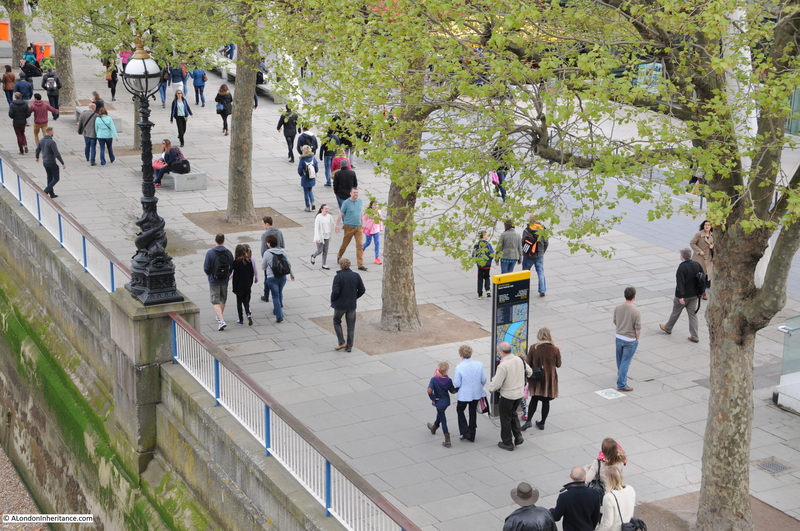 The Upstream Circuit told the story of the Land of Britain and in this post we will walk round the Downstream Circuit which occupied the space between Hungerford and Waterloo Bridges and told the story of The People. Firstly, a couple of views of the Downstream Circuit from Waterloo Bridge. 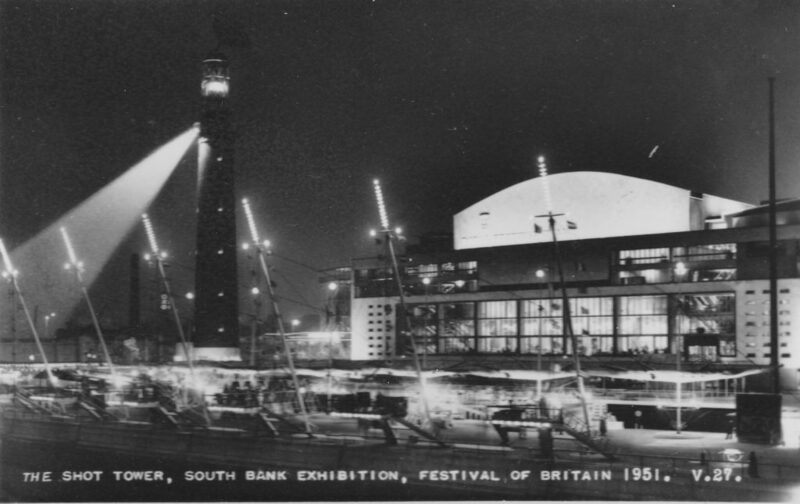 The first shows the Royal Festival Hall and Shot Tower. On the river is the Rodney Pier, named after the British naval officer Admiral Rodney who served in the Royal Navy and was involved with many battles against the Spanish, French and during the American War of Independence. There was a second pier on the Upstream Circuit named the Nelson Pier. 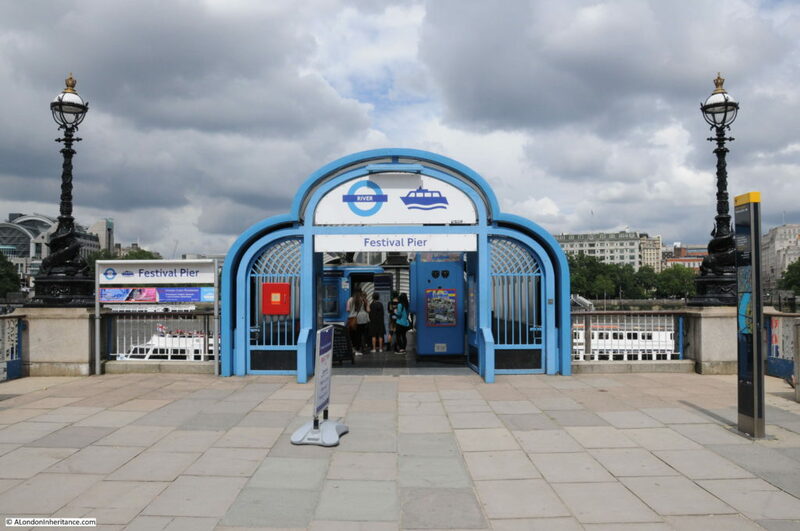 These two piers allowed boats and their passengers arriving from along the Thames to access the festival and also shuttle services to two of the other main London events. A shuttle service ran to Battersea for the Festival Pleasure Gardens and a second shuttle service ran to the West India Dock where a special bus service would take visitors to the Architecture Exhibition at Poplar. A view of the Downstream Circuit close to the river bank showing the cluster of pavilions, cafes and event spaces around the Shot Tower. 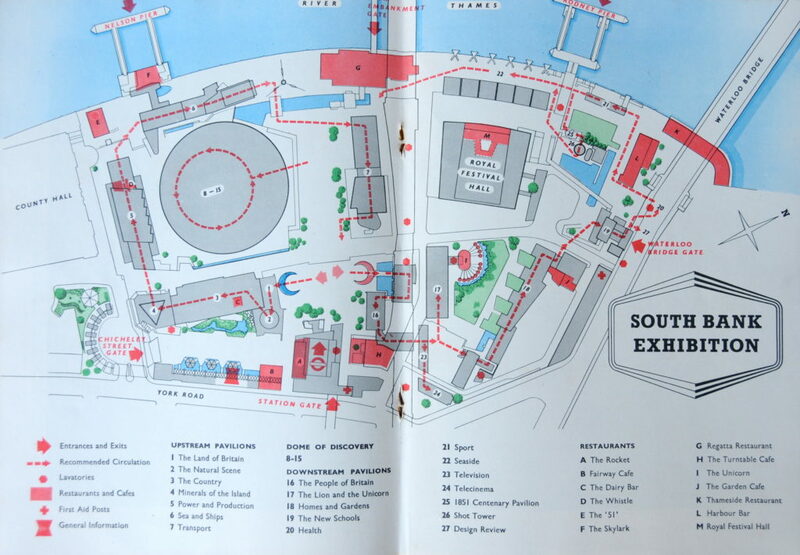 Here again is the map of the South Bank Exhibition. The pavilion told the story of the first islanders from the stone and bronze ages, the Celts then came from Northern France and gave a fresh impulse to the development of agriculture across the country. Then came the Romans who gave the Britons “a first taste of a civilisation”. This was followed by Christianity, then the Norse and Danish Vikings and finally the Normans – the last invaders. The long history of arrivals to the country from the earliest settlers to the Normans were all absorbed into the life that was here before them and each wave of settlers became islanders. As I discussed in the post on the background to the festival, the story of immigration and settlement in Britain from the perspective of the festival ended with the Normans and later immigration or migration from the Commonwealth was not included in the story of the British people. 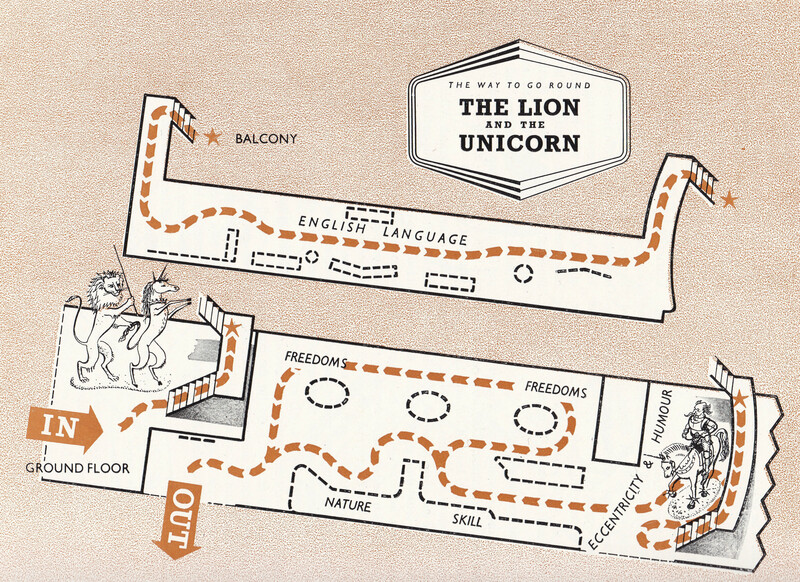 Leaving The People of Britain pavilion, we head to pavilion 17 – The Lion and the Unicorn. The Lion and the Unicorn Pavilion was on the space now occupied by the Whitehouse apartments. I could not get to the exact position as the above photo as the Whitehouse buildings now occupy the site, however in the photo below, the Lion and the Unicorn pavilion occupies the space to the right. A colour photo from the time of the festival looking along Belvedere Road. The Lion and the Unicorn Pavilion is the building on the left, between the large tent and the railway viaduct. As discussed in my post on the background to the festival, the Lion and the Unicorn Pavilion attempted to show and explain the British character to the visitor with the Lion and the Unicorn symbolising two of the main qualities of the national character: “on the one hand realism and strength; on the other fantasy, independence and imagination“. The following plan shows the pavilion and the main sections. 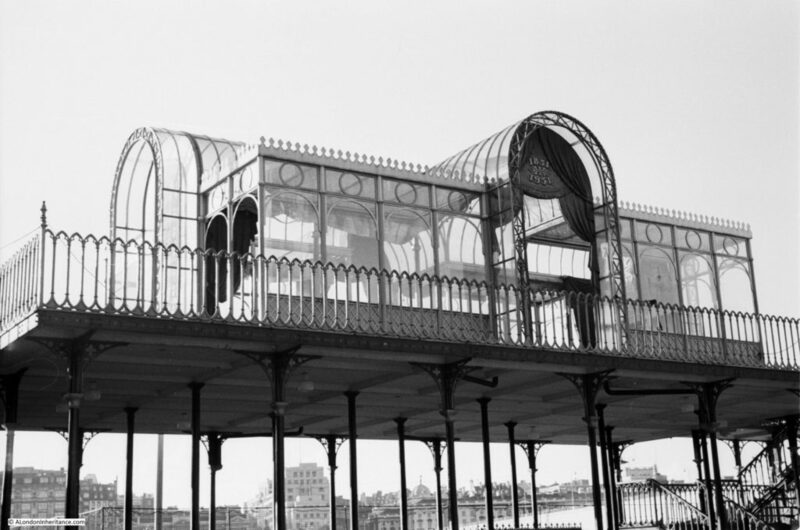 The main characteristics of the British people covered in the pavilion were, Language and Literature, Eccentricities and Humours, Skill of Hand and Eye and the Instinct of Liberty. On entering the pavilion, the visitor would see high on a side wall, very large straw figures of the Lion and Unicorn set in front of the legend “We are the Lion and the Unicorn, twin symbols of the Briton’s character. As a Lion I give him solidarity and strength. With the Unicorn he lets himself go“. The large straw figures were created by Fred Mizen who lived in Great Bardfield in Essex who was an agricultural worker and specialist in thatching and straw work. To illustrate the character of the Unicorn, he was holding a rope which led up to a giant birdcage hanging from the roof of the pavilion. The rope had opened the door of the birdcage allowing a flight of plaster doves to escape and were shown suspended in flight along the length of the pavilion roof. The pavilion included exhibits such as the Oxford Lectern Bible displayed on a fifteenth century church lectern, scale models of sets for Shakespeare’s plays, portraits of British authors, recordings of local speech from across the country showing how there was much diversity in the spoken word. There were a number of murals used in the pavilion. 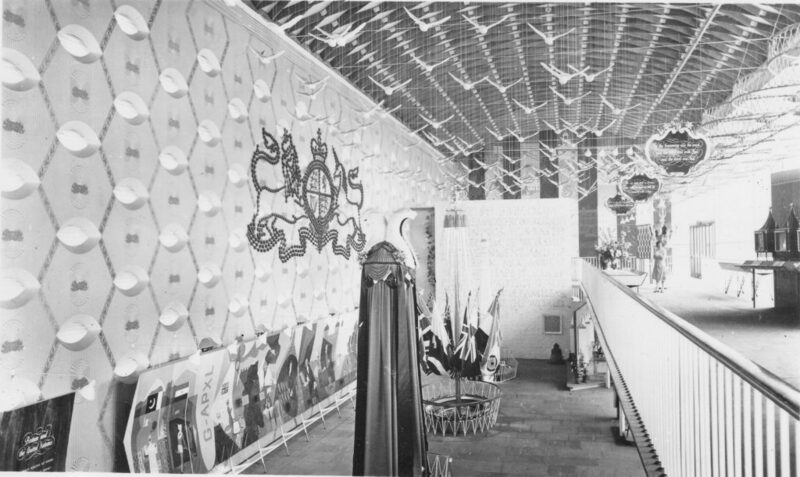 The photo below shows part of the interior of the Lion and the Unicorn Pavilion and to the lower left is a large mural along the wall. The mural was painted by Kenneth Rowntree and titled “The Freedoms”. The mural used a number of scenes from history to highlight the British concept and struggle for freedom including the Tolpuddle Martyrs, Emmeline Pankhurst and the fight for woman’s suffrage. If you look to the left of the mural, you can see part of an aeroplane wing marked G-APXL which was a divider between the British scenes and a couple of panels on the “British colonies”, which may have been added as an afterthought, with the message that Britain had freed the countries of the Commonwealth by giving them better living conditions. Again, one of the very few references to the Commonwealth with a message that does not fit well with the current view of Empire and Commonwealth. “Fifty million people live on a slice of land which covers an area of less than a hundred thousand square miles – smaller than New Zealand where less than two million people live. Eighty per cent of those people have their homes in towns where the demand for space is clamorous. The great task lies, then, in planning the towns and the houses as a whole. This subject is covered in the Festival Exhibition of Architecture at Poplar. Here on the South Bank, our concern is with some of the units within the house itself; and in the Pavilion a picture is presented of contemporary living created by and for the British family of to-day”. 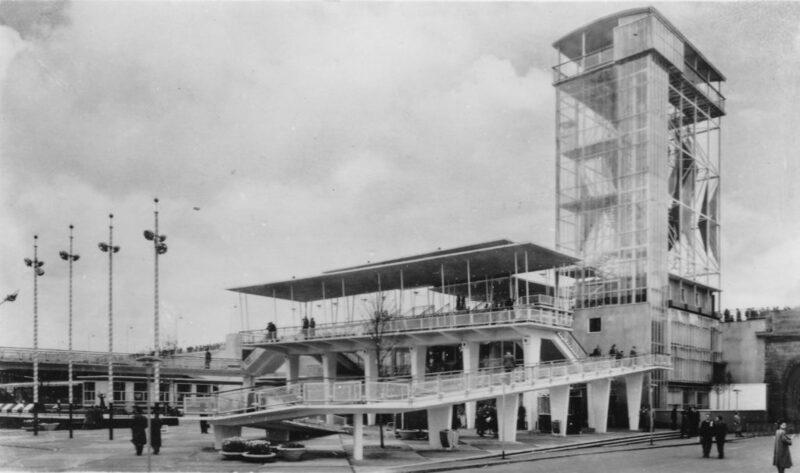 The aim of the pavilion was to show how British design had addressed the needs of the British family of 1951. Six rooms were chosen and a team of designers selected for each of the rooms. 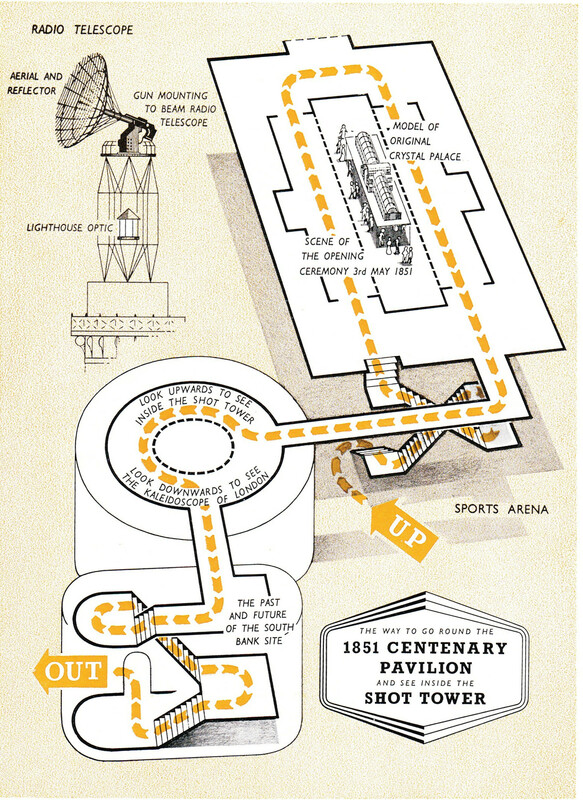 The route through the pavilion took the visitor to each room in turn where they could see how each team of designers addressed the function of each room and the types of products that the consumer could expect to purchase in the future to use within and decorate each room. “The parlour has long-lost its original meaning as a place where people could sit and converse. Today the very word has a frowsty sound. Yet, quite often, when architects have provided a family with a larger living-room instead of a parlour, one corner has been turned nostalgically into a token parlour-substitute. It is evident, then, that many people still feel the need for a room apart, where photographs and souvenirs can contribute memories, and where the fireplace can be treated as an altar to house-hold gods. So the designers have shown how such a need can be met, in twentieth-century style and without any trace of frowstiness”. Leaving the Homes and Gardens Pavilion, if we run up to Waterloo Bridge and look over the area we would get the following view. There is another of the festival cafes at lower right, here the Garden Cafe. Again see the use of colour across the site. Significant changes were taking place in education after the war. The 1944 Education Act empowered local education authorities to provide education for every child in the country between the ages of five and fifteen. The act brought in a three stream system of schools with grammar schools, secondary technical schools and secondary modern school, along with the comprehensive school system which would combine the three separate streams. The 1944 Education Act also required local education authorities to provide school meals and milk. The New Schools Pavilion provided the visitor with a view of what the future school would look like and how it would be equipped. Class room settings, school furniture, laboratories were all on show within the pavilion along with presentations on how the education system would work and the type of teaching children would experience. 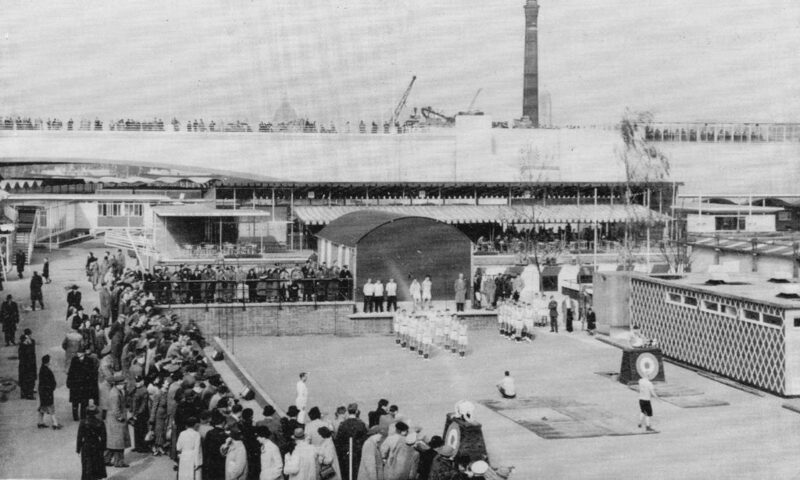 The New Schools Pavilion was an example of where the Conservative Party saw the festival as a display of Labour party policies. Despite there being no references to politics throughout the festival there was a concern that the visitor may associate the positive view of future schools with the government of the time. The following photo shows the edge of the New Schools Pavilion and the full height of the Shot Tower with the radio antennae mounted on the top. The mount for the antenna was an old anti-aircraft gun with the antenna dish mounted along the line of the gun barrel. Installing the anti-aircraft gun at the top of the tower was not without problems and it was only at the second attempt that the gun was successfully installed. At the first attempt, the gun crashed to the ground injuring one of the gunners trying to install the gun. Behind the Shot Tower at position 21 on the map is the Sports Arena which was used to demonstrate a wide variety of sports during the festival. 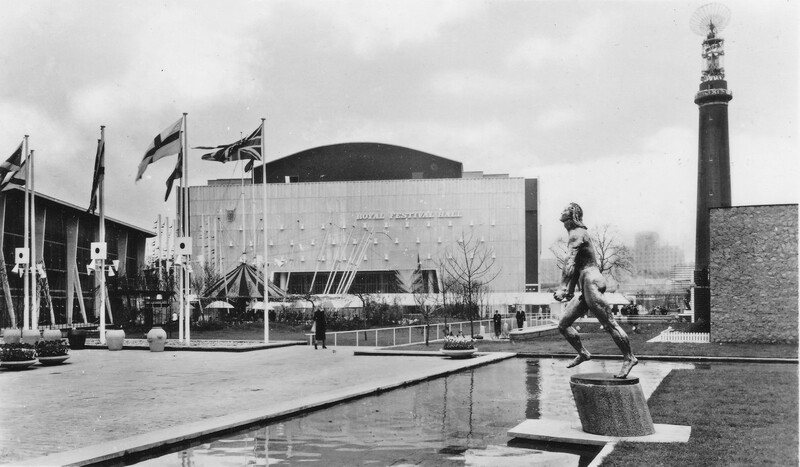 One of the aims of the Sports Arena was to encourage visitors to the festival to take part in sports, indeed the view at the festival was that it is more important for wide participation in sport across the population, than British sportsmen leading the world. Look to the right of the Sports Arena and just in front of the Shot Tower and you will see a model of the 1851 Great Exhibition on stilts. I will come to this later in this post. Another view of the Sports Arena showing the location in relation to Waterloo Bridge. In the background of the Sports Arena photo, there was a model of the 1851 Great Exhibition. My father took a photo of the pavilion after the festival had closed. 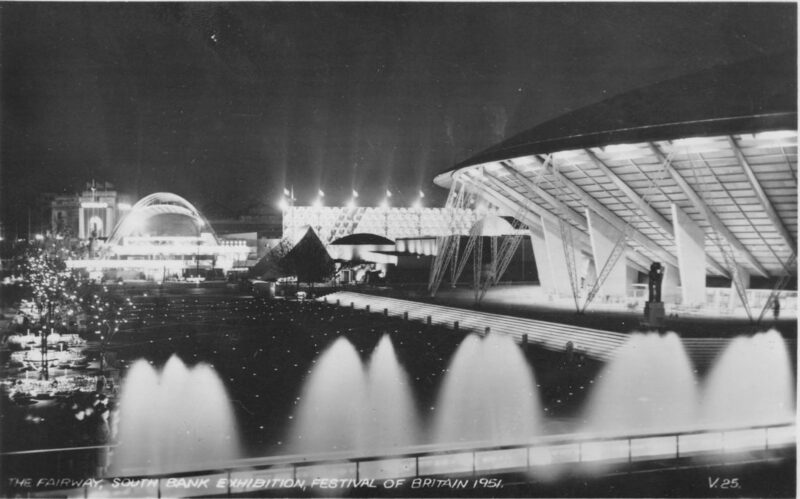 Although the centenary of the 1851 Great Exhibition was one of the original justifications for the 1951 Festival of Britain, it was almost forgotten in the planning of the pavilions and exhibits. The raised pavilion was almost an afterthought to ensure there was a reference to the exhibition of 100 years earlier. At each end of the interior of the pavilion were rotating screens with coloured views of different aspects of the 1851 exhibition. In the centre, a model of the exhibition along with a model of the opening ceremony along with a spoken description of the scene and music performed at the 1851 opening ceremony. It is understandable that there was very little reference to the 1851 exhibition in 1951, the centenary being almost accidental. The 1851 exhibition was an international exhibition with manufactured goods from across the world whereas the 1951 exhibition was focused on British industry. 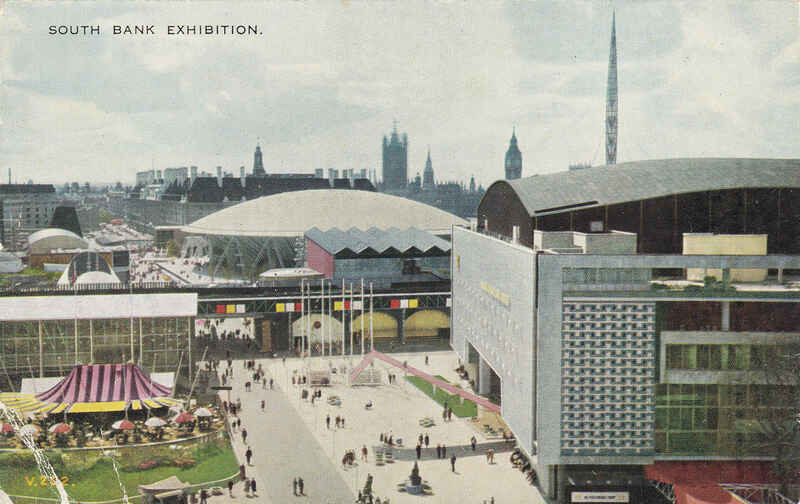 The 1951 exhibition was also a celebration of Great Britain – the land and people compared to the 1851 exhibition’s international outlook. The seaside was where “the British feel the need to relax – either after a hard week in their industrial cities or a hard year on their land”. 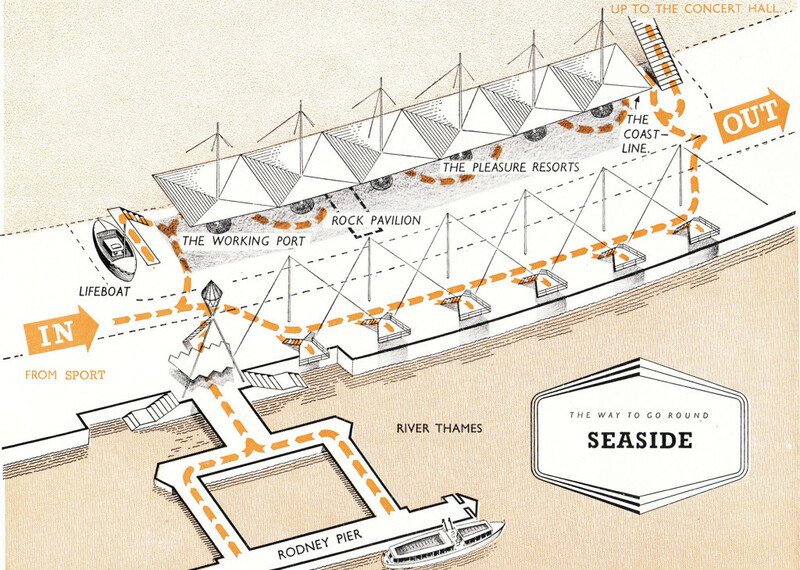 The Seaside was characterised at the festival as “All this bright and breezy business with magic rock and funny hats and period peepshows, is conducted here against the background of a characteristically British seafront; a medley of Victorian boarding-houses, elegant bow-fronted Regency facades, ice-cream parlours, pubs, and the full and friendly gaudiness of the amusement park”. The Seaside also touched on the equipment needed by those who work on the shores of the country and the display included the latest design of lifeboat. The view of the coast within this section also included a display of five samples of stretches of coastline to show the visitor the beauty and variation to be found along the British coast. That completes the walk through the Downstream Circuit of the exhibition. In addition to the core areas and pavilions we have walked through, there were two other minor displays. One covering Television which told the story of the development of television and how the service by the BBC (reintroduced 5 years earlier) will provide a platform for entertainment and information. There was also a Telecinema, which was the first cinema in the world to be specially designed and built to show both films and television. The Telecinema showed live broadcasts from across the festival site along with a series of documentaries specially produced for the festival. And as a final view of the site as we leave across Hungerford Bridge here is a photo my father took shortly after showing the Royal Festival Hall, the viewing platforms over the river and to the lower right of the Royal Festival Hall, one of the many outdoor works of art that were installed as part of the festival. Also on the right of the Royal Festival Hall is the flagpole that is now on the opposite side of Hungerford Bridge – see my photo of the flagpole in my post on the Upstream Circuit. 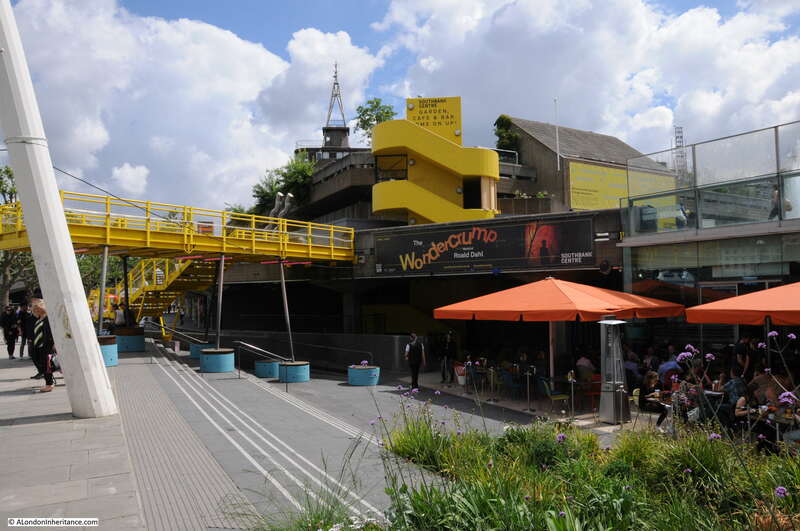 The majority of the old festival site is still dedicated to arts and entertainment with the Royal Festival Hall at the core along with buildings created since the festival such as the Queen Elizabeth Hall, the Purcell Room and Hayward Gallery, built on the site of the Shot Tower. Both the old Upstream and Downstream Circuits were split into two with the Shell Centre upstream and downstream buildings occupying the space. The area between Belvedere Road and the river in the upstream area is now the Jubilee Gardens with the London Eye occupying the space where the 51 Bar and the Nelson Pier were located during the festival. The site continues to undergo major change with the low rise office buildings around the Shell Centre Tower currently being demolished in preparation for a large cluster of new, mainly luxury apartments to be built. 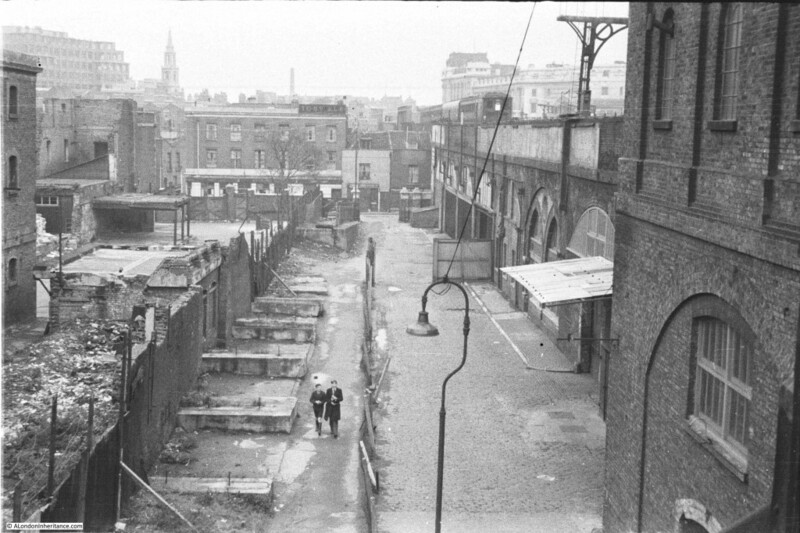 The following panorama taken from under the now closed footbridge from Waterloo Station to the opposite side of York Road (along the same alignment as the original festival Station Gate) shows the large building site that this area has now become – the original area occupied by the first pavilions of the upstream circuit. But throughout all these years of such significant change, Belvedere Road still runs through the site, maintaining a link with the original Narrow Wall when the Thames swept up to the marsh that covered much of Lambeth. 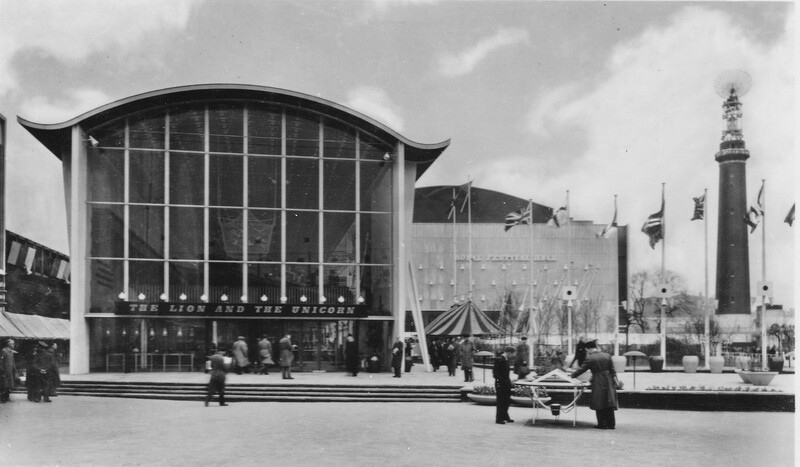 Following closure, the new Conservative government quickly ordered the demolition and sale of the festival pavilions, exhibits and artwork so by the end of 1952 not much was left. One can only imagine the frustration of the designers, architects and all those all had put so much work into creating a festival that although there were major gaps in the story the festival told of the British and it could also be a rather narrow view, the festival did provide a very optimistic view of the future and what the benefits of design, architecture, science and art could bring to the “man in the street”. 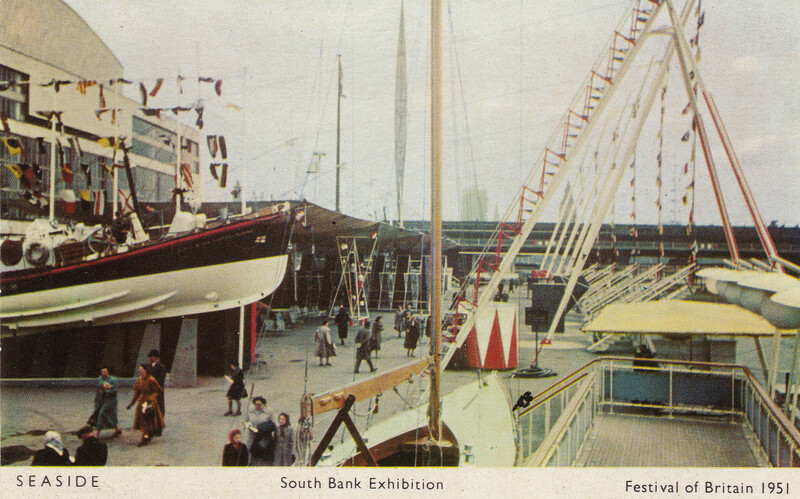 I hope you have found these last three posts on the Festival of Britain – South Bank Exhibition of interest. In the coming weeks I will cover the wider aspects of the Festival along with visits to the Festival Exhibition of Architecture at Poplar and the Festival Pleasure Gardens at Battersea. And looking at the area today, a film produced for the Waterloo Sights and Sounds project which can be found here. This entry was posted in Events and Ceremonies and tagged Festival of Britain, Lion and the Unicorn, Royal Festival Hall, Shot Tower on July 13, 2016 by admin. 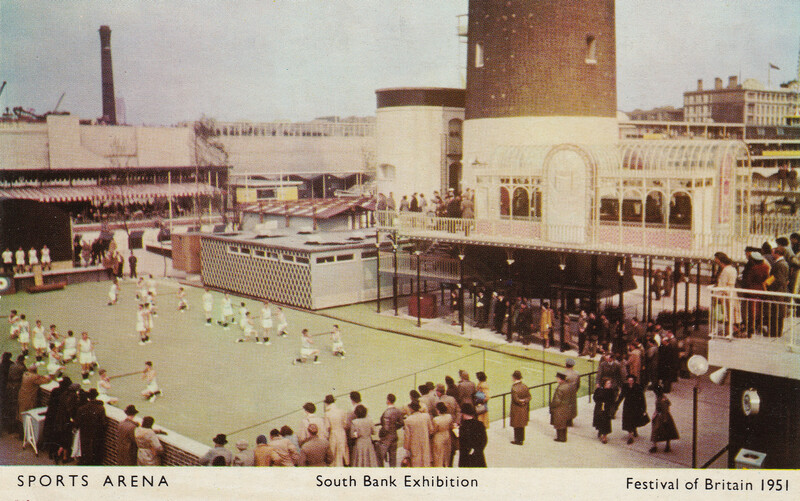 Now for the final post in my trilogy on the history of the South Bank. 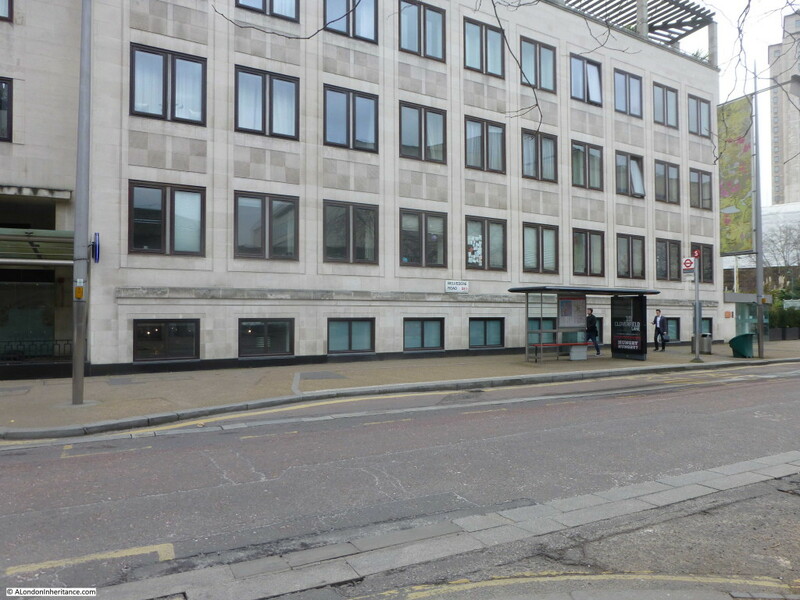 In my last post, we had walked the length of Belvedere Road which ends on the approach road to Westminster Bridge. 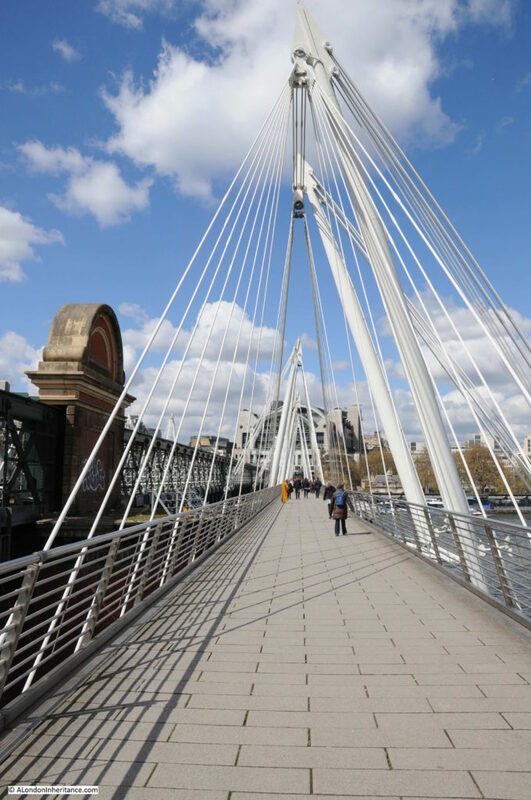 In this post, it is a quick walk along the north bank of the river to get some views of the South Bank, then back across Hungerford Bridge to look at the building of the Royal Festival Hall. 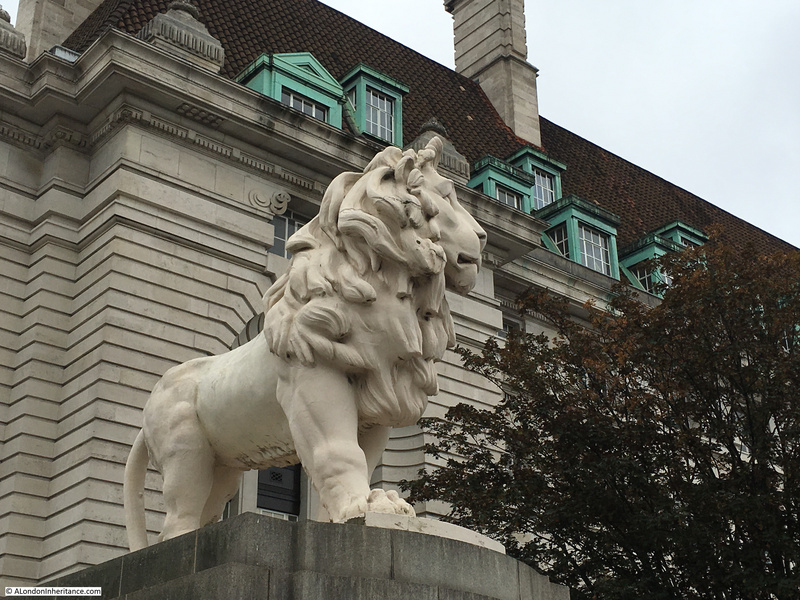 A short distance after leaving Belvedere Road and just before crossing Westminster Bridge is the lion that was at the top of the Lion Brewery building on the river facing side. The lion is now on a large plinth which a plaque on the south facing side of the plinth with a brief history of the lion and how it came to be at the current location. We will meet the lion again as we cross Hungerford Bridge. At the end of Westminster Bridge, turn along the north bank of the river, almost to Hungerford Bridge and look across the river to the South Bank. 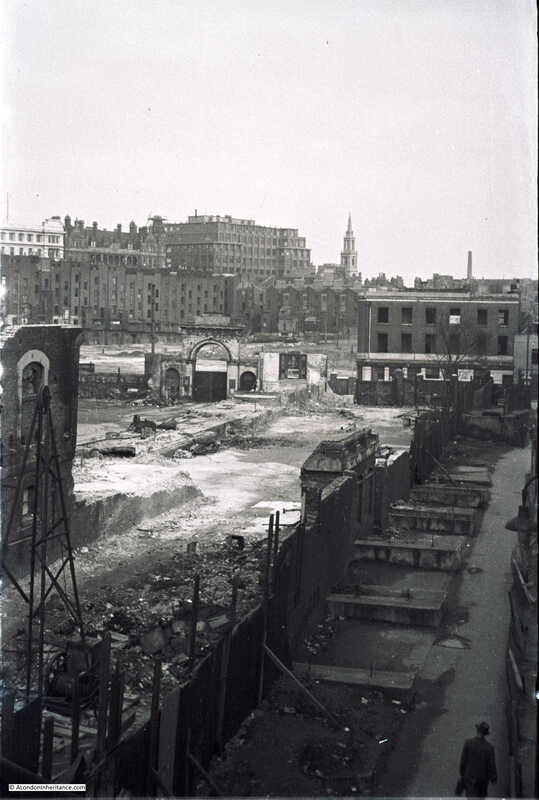 My father took the photo below when demolition of the buildings between County Hall and Hungerford Bridge had commenced. The shell of the building in the background is the India Store Depot. Along the edge of the river is a huge pile of rubble from the demolition work that had already taken place across the area. 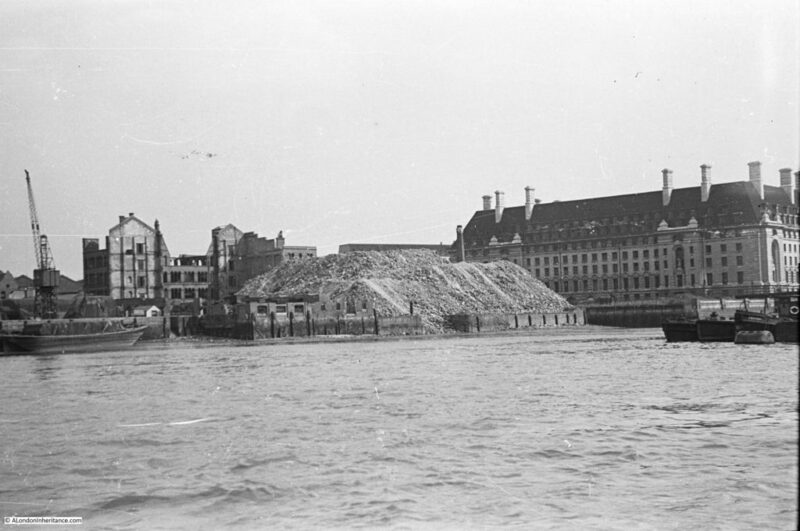 This was used to help build the extended embankment along the Thames where the embankment that has been built in front of County Hall would be extended all the way to Waterloo Bridge creating additional land that would be used for the Festival of Britain and would finally close and fill in all the various wharfs and inlets across this stretch of the river. The following photo is from roughly the same position today. Not easy to get a clear photo due to the ships that are now moored along this side of the river. 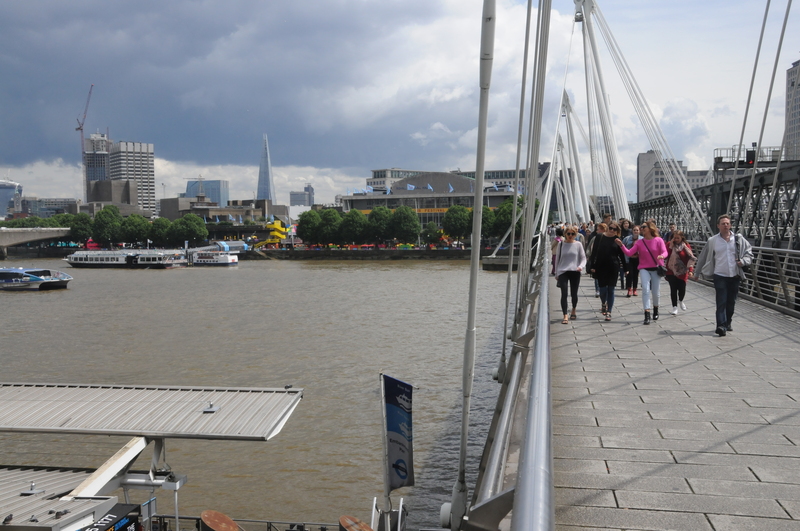 Now walk up to the footbridge on the side of Hungerford Railway Bridge that faces Waterloo Bridge. My father took the following photo from along here before the main demolition started. 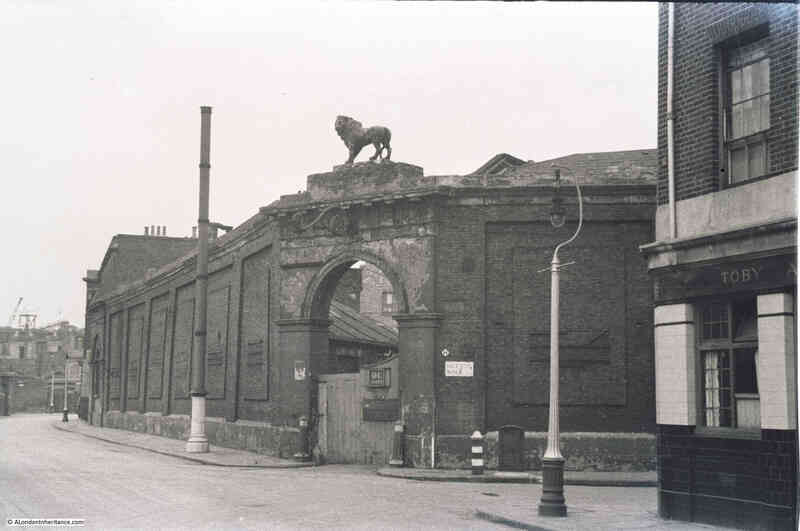 The Lion Brewery is on the right, still with the stone lion on the top of the brewery, the same lion that we walked past on the southern end of Westminster Bridge. The Shot Tower is on the left. 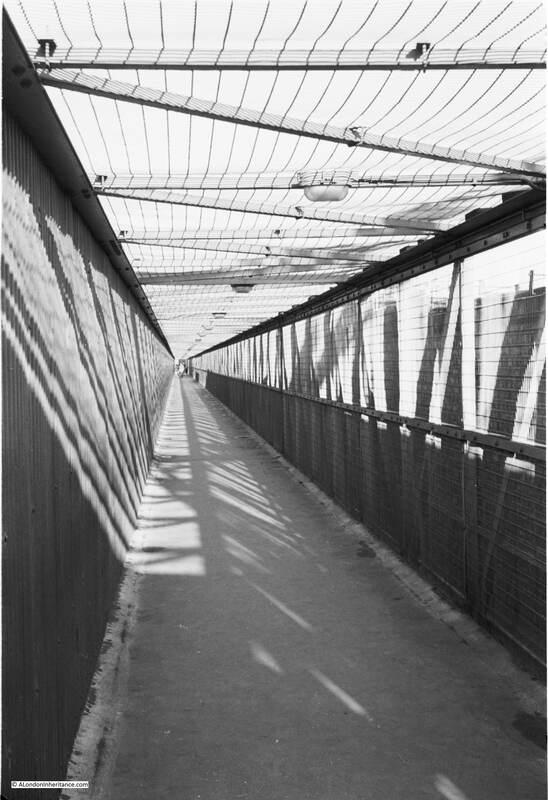 The original footbridge alongside the Hungerford Railway Bridge was a narrow walkway right up against the railway bridge, only on the side of the bridge facing Waterloo Bridge. This was replaced in 2002 by the much larger Golden Jubilee Footbridges which stand off from the railway bridge and are also on both sides of the railway bridge. This photo was taken when my father took a boat trip down the Thames from Westminster to Greenwich. 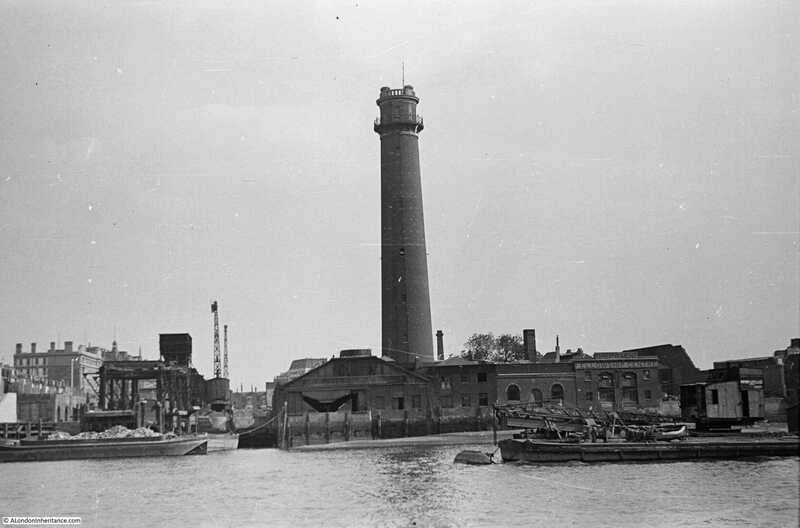 There is an inlet along the river edge to the left of the Shot Tower. Referring back to the 1895 Ordnance Survey map in my previous posts, this can be identified as Canterbury Dock. On the left of the Dock is a travelling crane. My father then took the following photo from the same position as the earlier photo, now showing the Royal Festival Hall under construction. 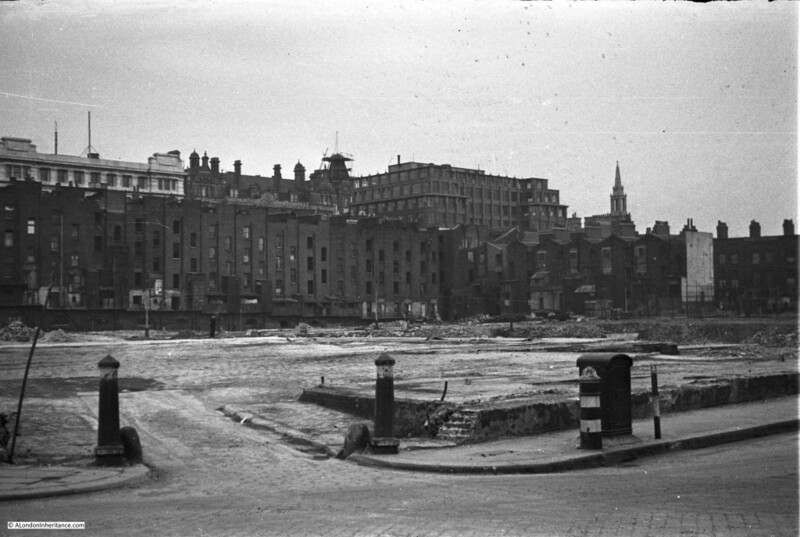 All the original buildings on the site have been cleared with the exception of the Shot Tower, although the very top of the Shot Tower has been removed ready for the installation of the anti-aircraft gun that would provide the mount for the antennae that would be used during the Festival of Britain to bounce radio signals off the moon enabling visitors to see the echo of the radio signal – part of the Festival’s demonstration of British scientific achievements. Walk further along the bridge and this is a closer view. The new embankment is also being built. 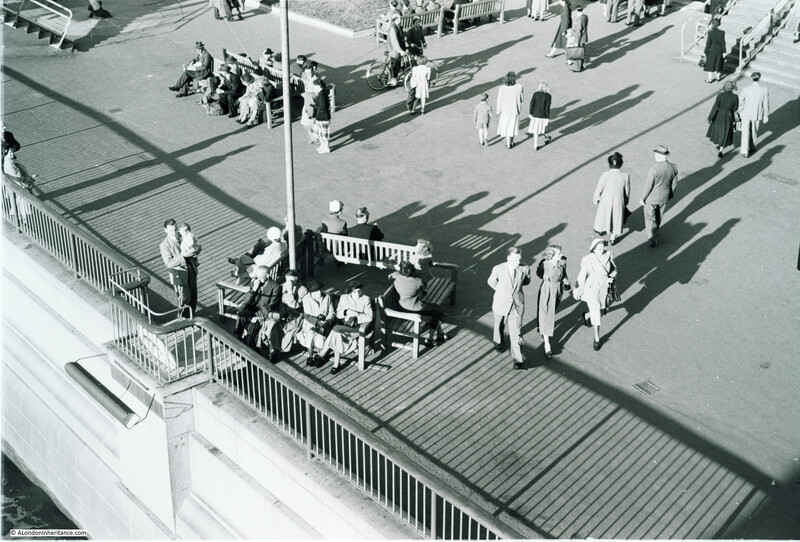 There are now a series of photos from the end of the footbridge, taken earlier than the above couple of photos, that show the digging of the foundations of the Royal Festival Hall. These start from the river edge and move round to the edge of the excavations. They show the amount of excavation needed as preparation for the rest of the build. 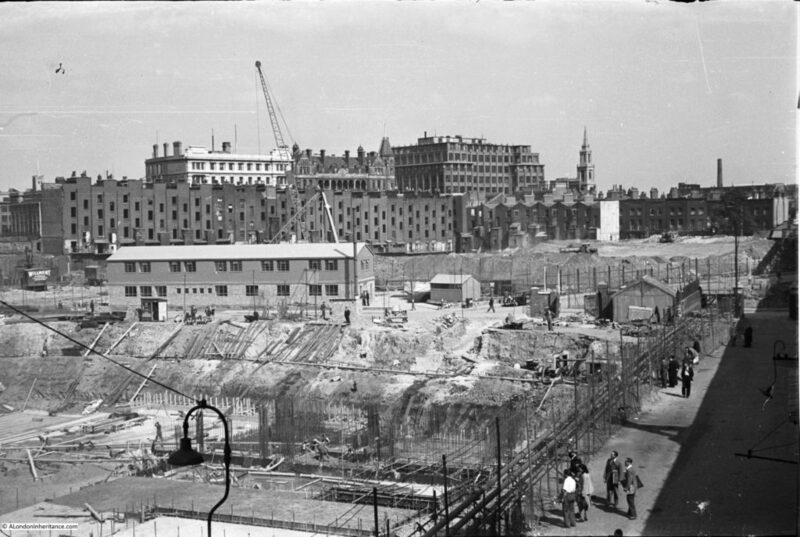 In this photo, the buildings of Howley Place can still be seen in the background behind Cubitts site office. And in this photo, the buildings that ran along the edge of York Road are still there. These, and the building along Howley Place would soon be removed ready for the construction of the rest of the Festival of Britain site. I stitched the above photos together to get a panorama of the building site. 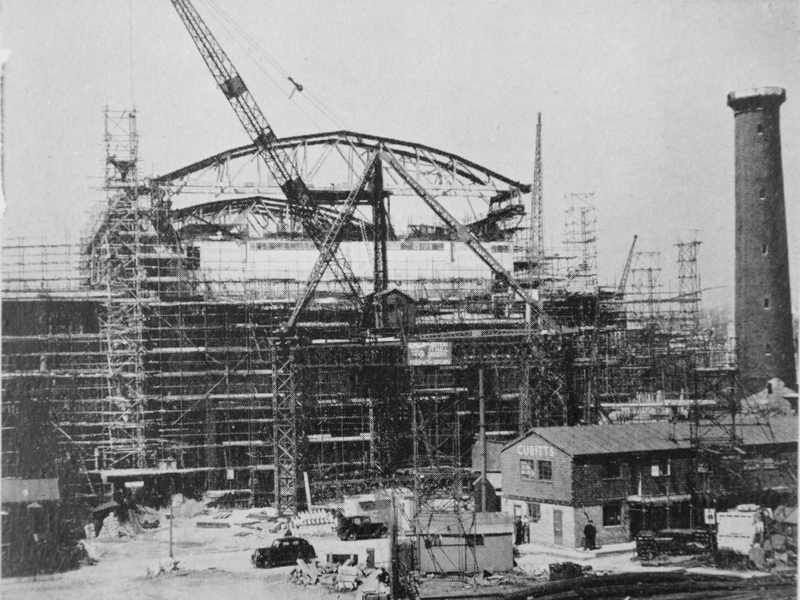 Construction of the Royal Festival Hall was documented in a book published for the Festival of Britain by the Association of Consulting Engineers. 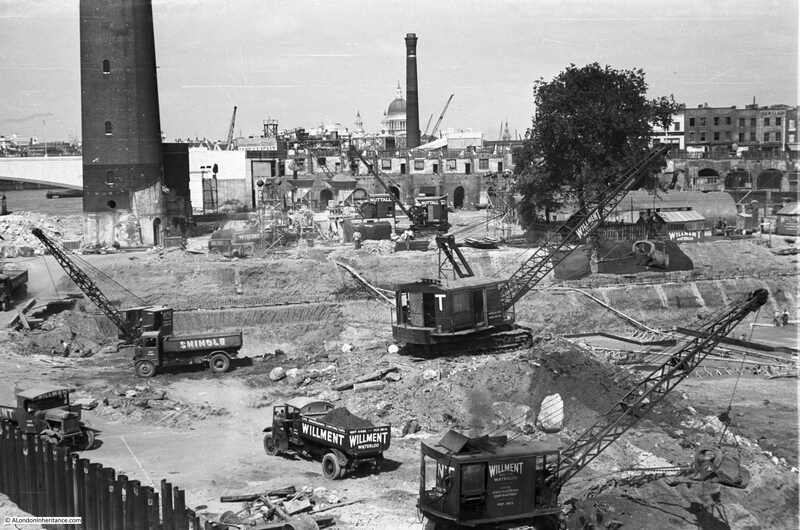 The book celebrates the role of Britain’s Engineers in a wide selection of global construction projects ranging from the Royal Festival Hall to Power Stations in South Africa and a Hydro-Electric scheme in Ceylon. The section on the Royal Festival Hall details construction and some of the challenges with the build, for example with the proximity to the river and high ground water level. The land on which the Royal Festival Hall would be built is described as miscellaneous fill and silt down to about 10ft and London Clay at about 20ft. The ground water level also rises and falls with tide from a level of 2ft below and 3ft above ordnance datum (see picture below). Work on the foundations started in May 1949 with bulk excavation of the whole area – as clearly seen in the photos above that my father took of the area. Bulk excavation was used as the easiest way to clear the area needed for the foundations. The centuries of previous construction on the site included the remains of the old water works along with the brewery which was built on a 6 foot thick mass concrete raft. 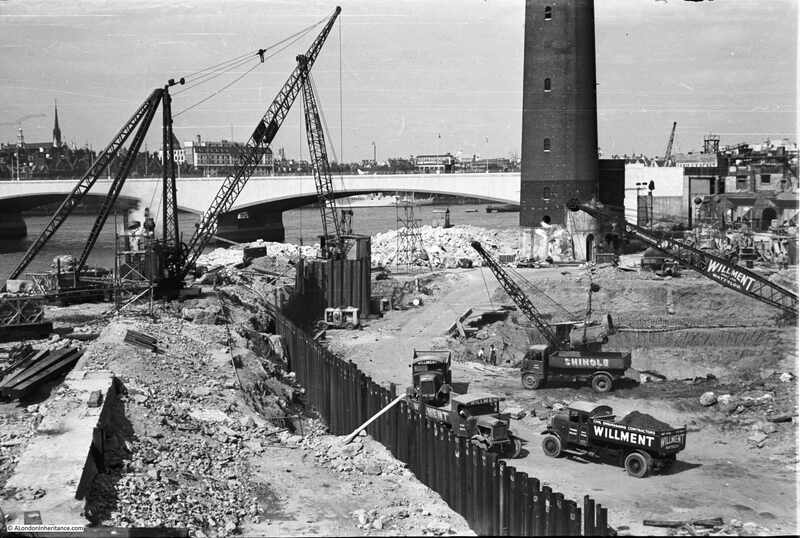 There was a large amount of work to prepare, which included sinking well points and then pumping out water which started on the 17th June 1949, when, withing four days the ground water level was reduced to 13ft below the ordnance datum. A huge volume of water was extracted, with at the start of pumping 150,000 gallons of water per hour were being pumped out, and even after the site had been “de-watered”, pumping was still needed of 80,000 gallons per hour to keep the area of the foundations dry. A total of 63,000 cubic yards of materials were removed for the foundations. To assist with construction, a 10-ton derrick and and 50ft gabbard was erected adjacent to Belvedere Road. 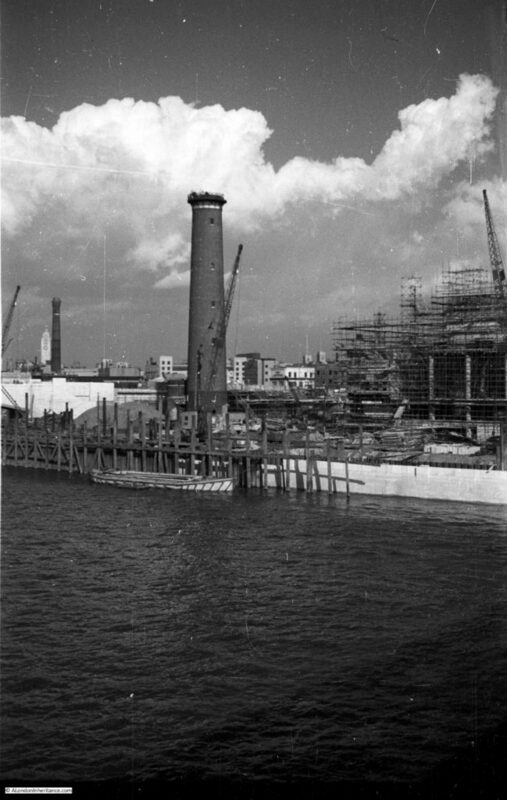 This is shown in the photo below and is the tripod like structure with the crane on the top platform – typical of the large cranes of the day, unlike the singe tower cranes that would be used today. Belvedere Road is running from left to right, the black cars show the location of the road and the Cubitts site office is the same as in the photos my father took along Belvedere Road and featured in the previous post. “The structure under and around the auditorium consists of floors carried on columns and without infilling walls. The external faces of the building being largely glazed. These fundamentals of the architectural design resulted in the rather unusual condition of the heavy mass of the auditorium weighing about 25,000 tons being supported at a high level on slender columns without lateral support. It was consequently decided to use the staircases at the four corners of the building as buttresses, and with this end in view they were designed as far as possible with reinforced concrete walls. It was found as the design developed that these walls had to be pierced by a large number of openings for ventilation and other services which has made them somewhat intricate. This result was not foreseeable at the time when the decision to use reinforced concrete walls was taken, since very little was known about the ventilation and other requirements. Had such information been available the design of the stair blocks would have been somewhat modified, although their function as buttresses would have had to be retained. This experience emphasises the importance of the ventilation scheme being developed at an early stage of the design of buildings. 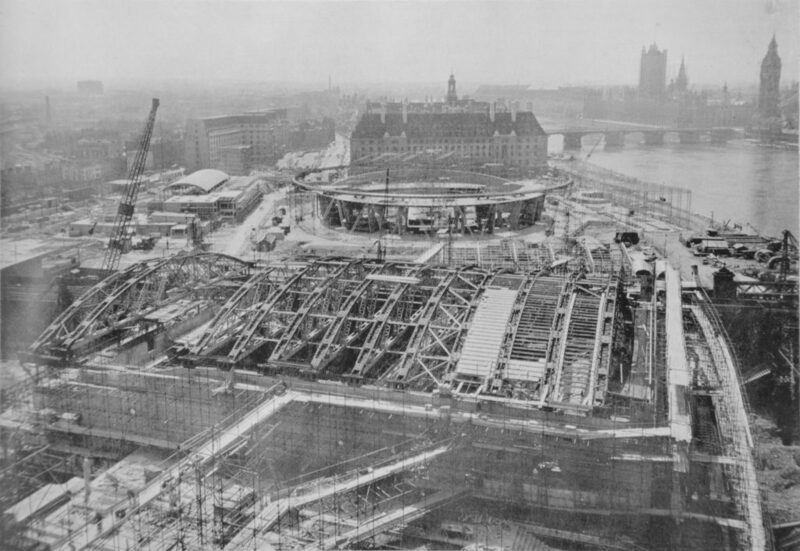 The comment about the need to pierce the buttresses and install ventilation again shows the speed with which the Royal Festival Hall was being built with plans still being completed as the building was being constructed. New plans would be brought across from the Cubitts site office to specify the next part of the build and any problems would need to be resolved where the new plans required a change to what had already been built. A criticism at the time that the Festival of Britain was planned and being built was that the manpower and resources being used were a distraction from the real need to build homes and factories after the devastation of the war, as well as the need to export production to bring in much needed foreign currency. The figures above illustrate the volume of materials needed for this single building. 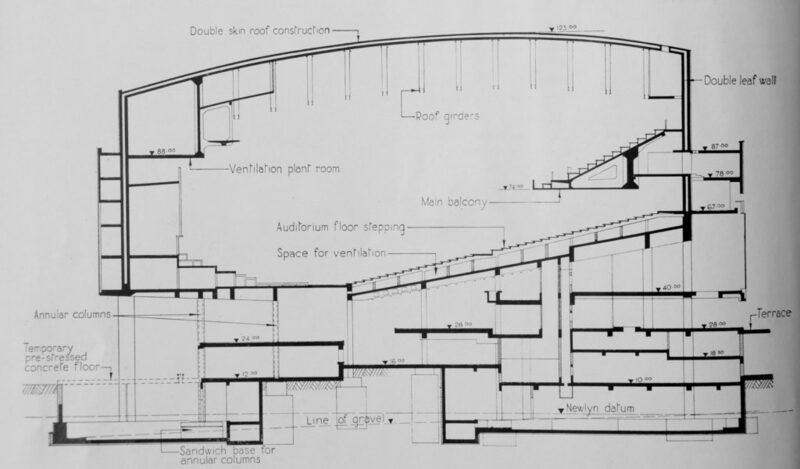 “The acoustic consultants originally laid down that the roof of the auditorium should consist of two leaves, the inner one 8 inches thick and the outer 6 inches thick. These leaves were to be supported by an air space of 12 inches minimum thickness, and where the outer leaf rested on supports from the inner leaf, it was to be isolated by some insulating material which was subsequently decided to be 2 inches of glass silk. In addition to the 8 inch and 6 inch roof slabs, the roof girders are also required to carry a 2 inch solid suspended ceiling, ventilation ducts and other miscellaneous items. It will be realised that this constitutes a roof of unusual weight. The structural engineers recommended that the acoustic consultants should reconsider the rook thickness, and it was finally arranged that an inner leaf 6 inches thick and an outer 4 inches thick would suffice, a saving of 4 inches of concrete or approximately 50 lb. per square foot on the original proposal”. The design was dictated by the limited area of the site which resulted in the raised auditorium allowing two levels of main floors below the auditorium consisting mainly of open space for the main reception, restaurants and bars and exhibition areas. Walking in from the South Bank takes you directly into these open areas from where the fact that the main auditorium is built above is not immediately obvious – a very clever design. The Royal Festival Hall went from design to completion in a very short time. A sketch design had been prepared by October 1948. Work on the engineering design started the following month in November 1948. 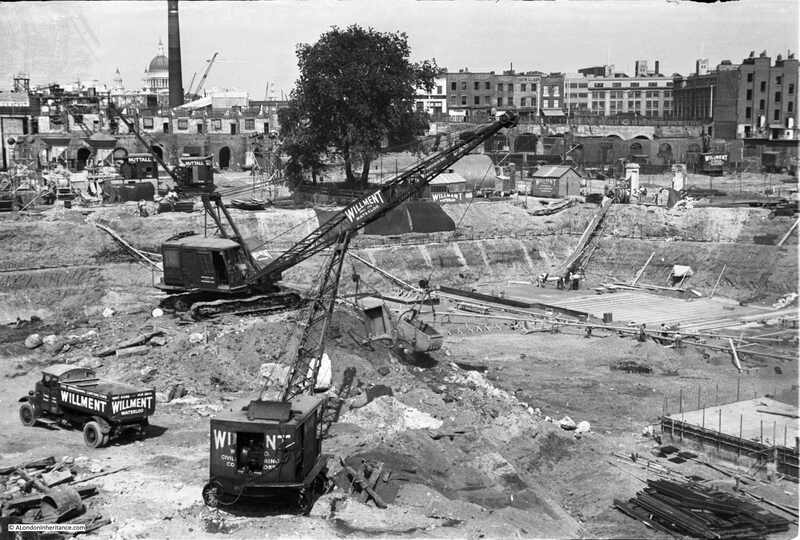 Work on foundations started in May 1949 with the concrete super-structure starting to rise above ground level in October of the same year. The reinforced concrete roof was completed by the end of September 1950. The short time for construction required work to continue throughout the cold winter of 1949/50. To ensure concreting work could continue during low temperatures, two stages were implemented. For stage one, precautions included heating of the mixing water, shielding and warming aggregate heaps to prevent them becoming frozen and covering over concrete with special mattresses. 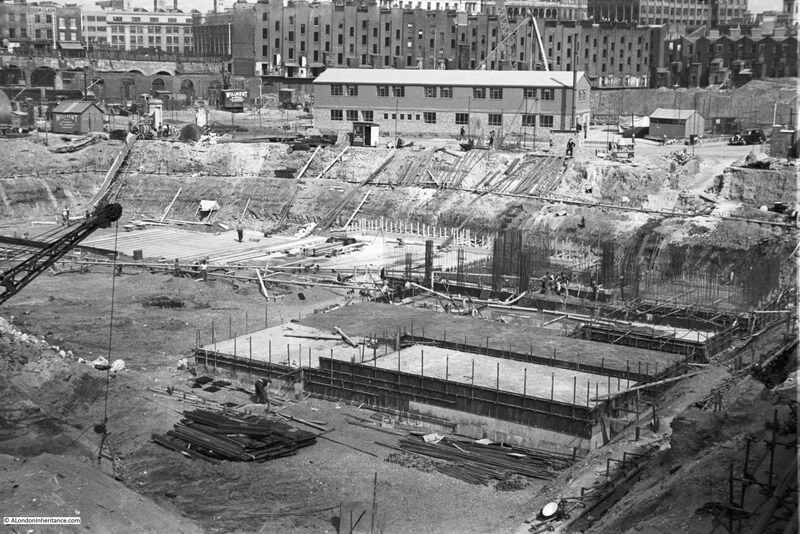 For even colder temperatures, stage two was needed during the early months of 1950 and included the use of a battery of steam boilers with steam heat being applied to newly concreted areas. This was a significant achievement given that the Royal Festival Hall was only one part of a major construction site on the South Bank. There were also many other construction priorities across the country, there was a shortage of money and foreign currency, rationing was still in place and the country was still recovering after over 5 years of an intense war. 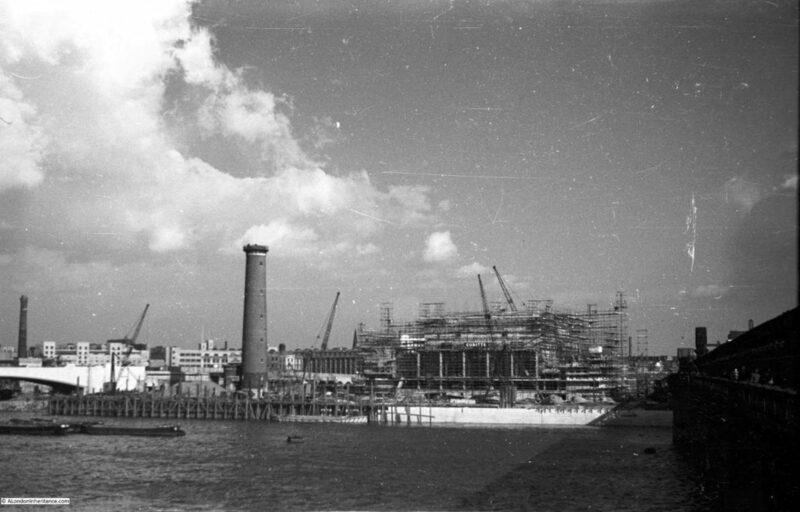 The following photo from the Association of Consulting Engineers book was taken from the top of the Shot Tower and shows the construction of the Royal Festival Hall in the foreground with the Dome of Discovery between the hall and County Hall, both surrounded by the construction site that will be the location of the Festival of Britain. Still standing at the end of the footbridge, this is what the area looked like prior to the construction of the Royal Festival Hall. 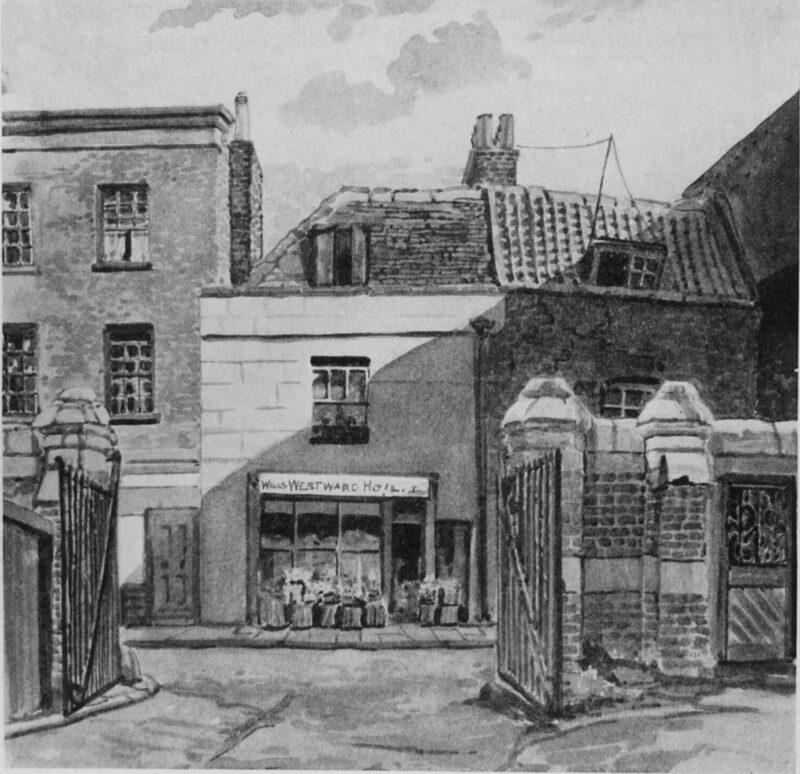 The Survey of London volume on the South Bank and Vauxhall included a drawing of the shop on Belvedere Road which can be seen at the far end of the road running alongside the railway arches. And months later, the same area with clearance well underway.The entrance arch to the Lion Brewery from Belvedere Road is still there. I mentioned in my first post on the South Bank that I first realised that my father had a large store of negatives of London when I started working here and he showed me some of the photos he had taken of the area. Back in 1980 I had also started taking photos of London which included photos around the South Bank and I have recently found and scanned some of these negatives. The following photo is the same scene as the above two, but taken in 1980. 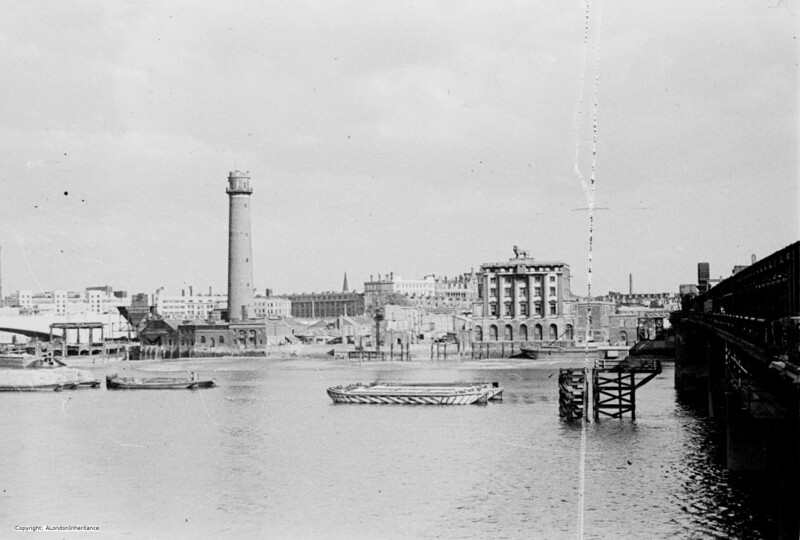 It is closer to the first of the above two photos, the part of the bridge on the right is still much the same and there is still a road on the lower right providing access to the arches underneath the railway. And below is my photo from June 2016 showing the same area, 36 years after I took the above photo and between 69 and 66 years after my father took the photos showing the various stages of the development of the site. It is much different now. New buildings have been constructed along the space of the original road. I have mentioned the footbridge alongside Hungerford Bridge a number of times and it was at the end of this bridge that my father took the above photos. He also took the following photo looking back from the southern end showing the bridge as it was when he was taking these photos between 1947 and 1951. The old footbridge is long gone and has been replaced by the Golden Jubilee footbridges that run on either side of Hungerford Bridge, unlike the original which only ran on the side facing Waterloo Bridge. I think you will agree, a major improvement to walking across the river. 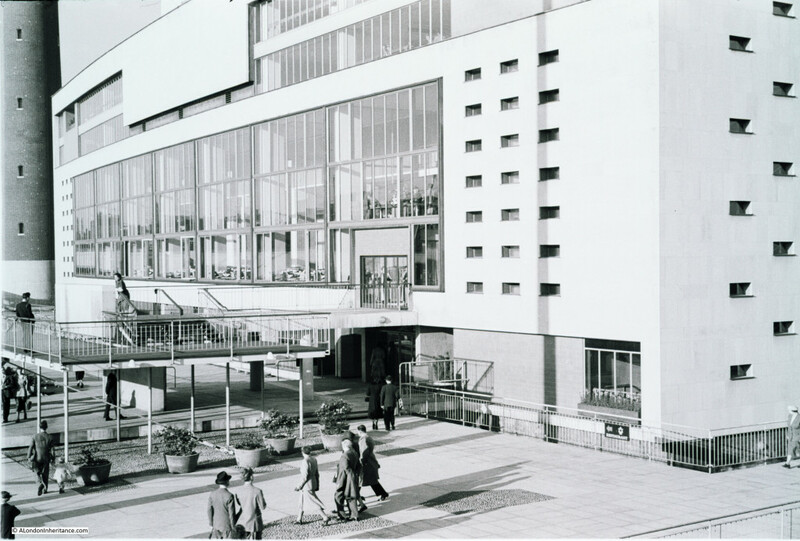 To finish off this exploration of the South Bank as it was before the Festival of Britain, walk straight on past the side of the Royal Festival Hall and walk down the steps to reach Belvedere Road and we have come full circle. 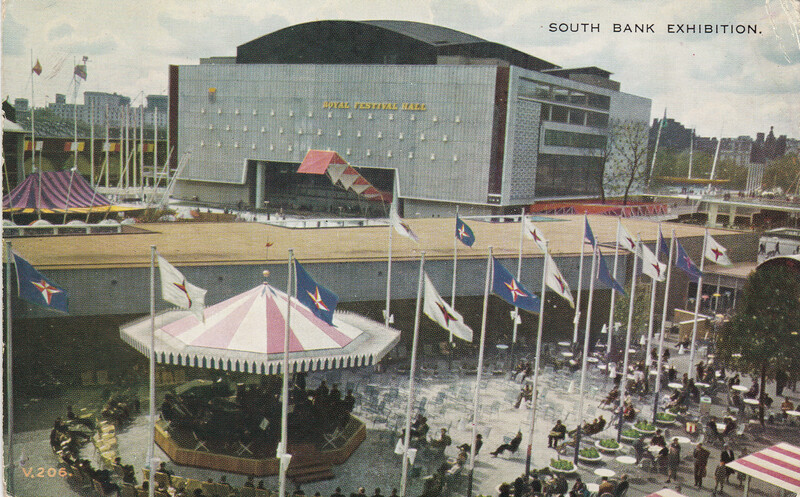 In my next post I will start to explore the Festival of Britain commencing with the South Bank Exhibition which occupied the area I have covered in my last three posts, and was the reason for the end to end clearance of the site and the construction of the Royal Festival Hall. This entry was posted in London Buildings and tagged Belvedere Road, River Thames, Royal Festival Hall, South Bank on July 5, 2016 by admin. 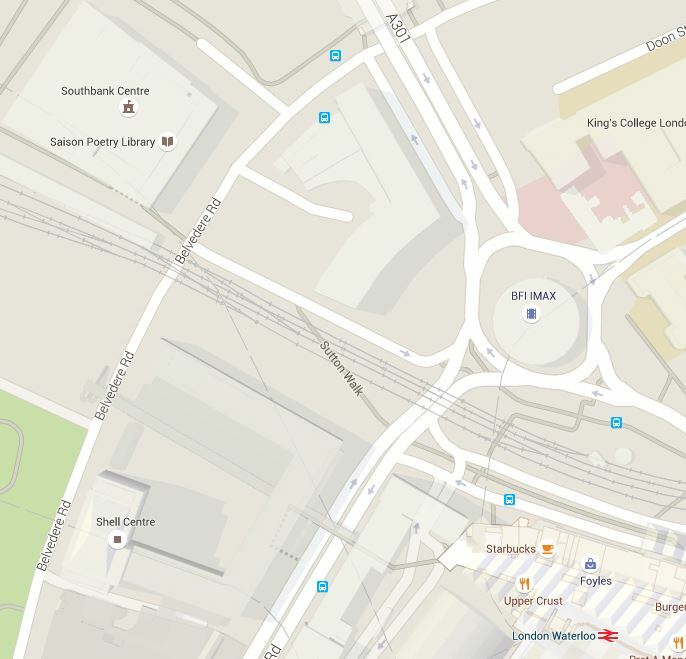 Chances are, if you have walked from Waterloo Station down to the Royal Festival Hall, or the Southbank, you have walked along Sutton Walk without really being aware that you have. 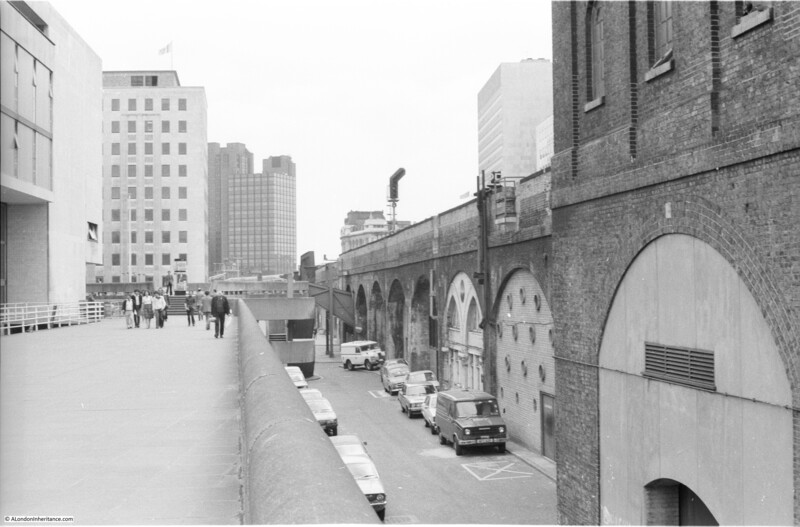 Today, Sutton Walk is a short stretch of pedestrian walkway through one of the rail arches under the rail tracks leading up to Hungerford Bridge, however it was once a short street leading down to the Lion Brewery on Belvedere Road. 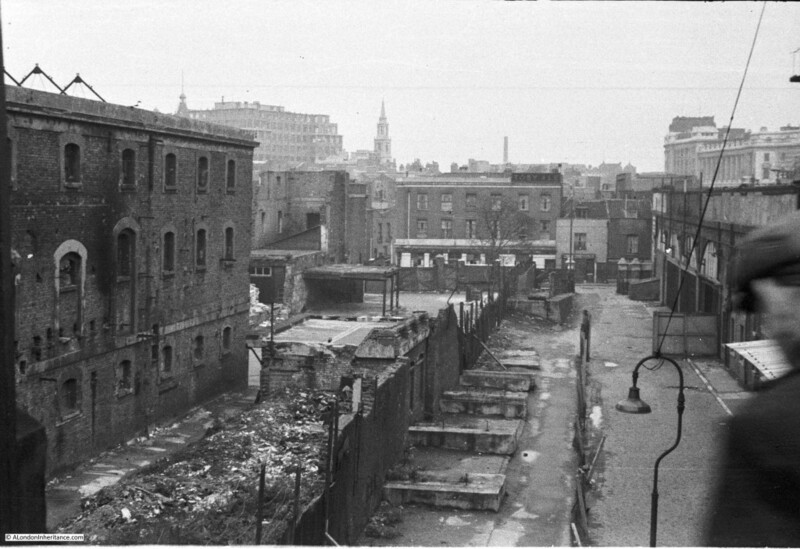 Before the demolition of the original buildings along Belvedere Road, my father took some photos in 1947 from the junction of Sutton Walk with Belvedere Road. These show part of the old Lion Brewery that are not often seen. There are many photos from the river (including some my father took here), but in this article I want to show the other side of the brewery. 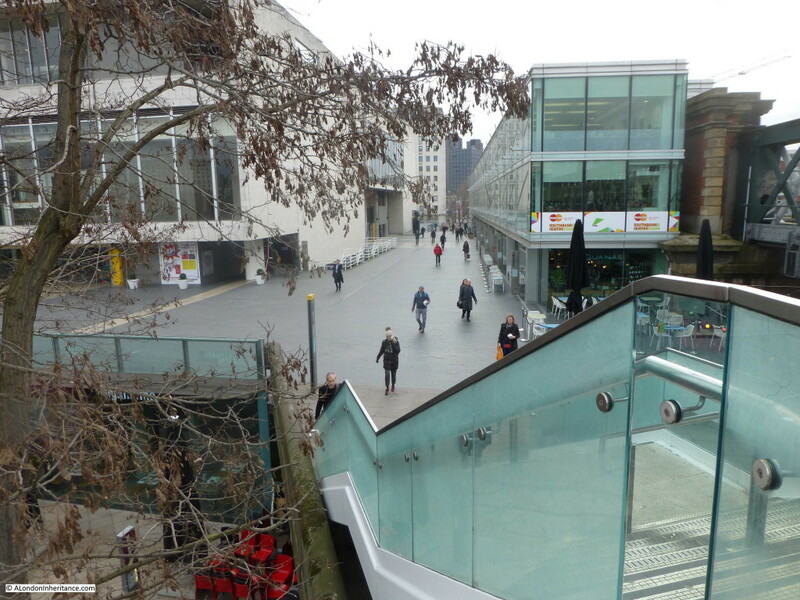 In the first photo, we are standing in the original Sutton Walk. The road running left to right is Belvedere Road. 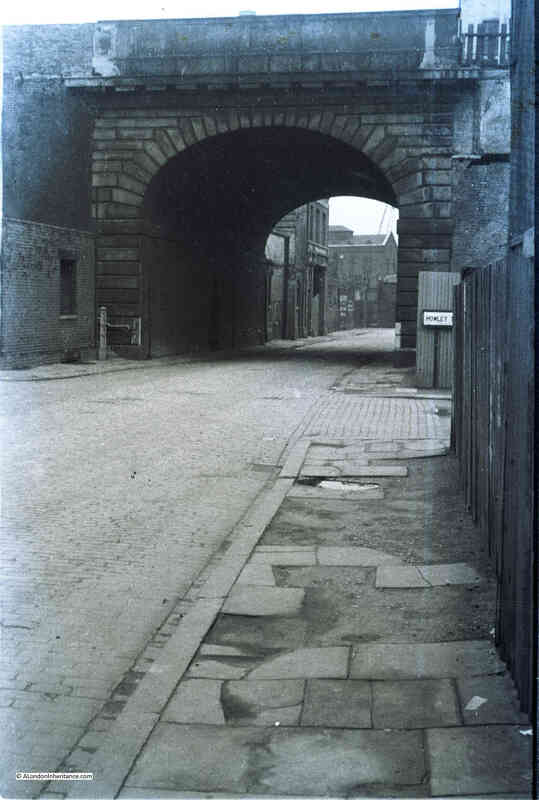 Straight ahead is the archway leading into what was the Lion Brewery. The word “Brewery” remains on the block at the top of the arch, however the stone Lion that originally sat on top of the arch has already been removed, leaving only the stubs of metal rods that would have held the Lion to the arch. Framed within the archway is Shell-Mex House on the north bank of the river. 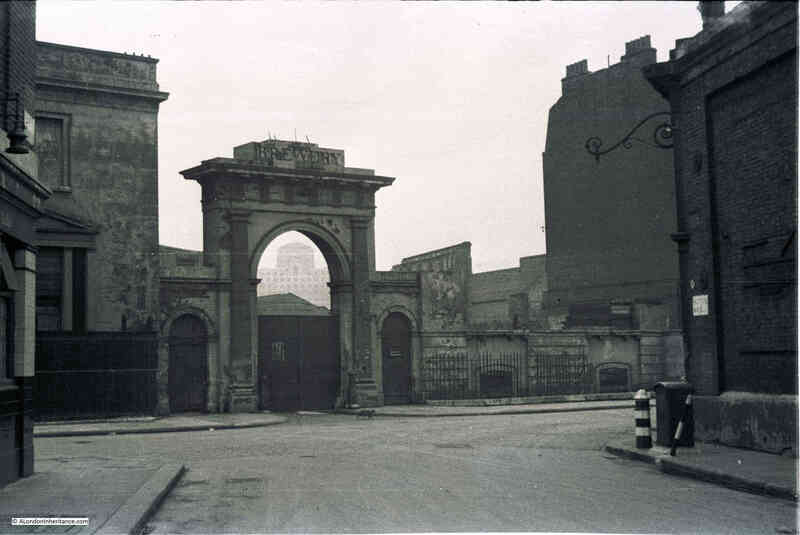 Originally on the right of the arch was a building of identical design to the building remaining on the left, and the main brewery buildings would have been visible through the arch. It must have been an impressive sight when the brewery was in full production. One can only imagine the number of barrels of beer that have come through that archway. The brewery was built between 1836 and 1837 on the site of a Water Works that supplied water to the local area using water taken directly from the river. Prior to the water works, a house called Belvedere (the origin of the road name) occupied the site. This became a tavern in 1781 and along with the gardens, was opened to the public following the tradition of “pleasure gardens” being opened along the south bank of the river. The brewery building was seriously damaged by fire in 1931, after which it was used for a brief period as a storage place for waste paper. This whole area was demolished in the late 1940s ready for the construction of the Royal Festival Hall and many of the streets were either lost or considerably changed. Although Sutton Walk does not now extend down to Belvedere Road it is still easy to find the location of my father’s photos by extending the line of the remaining pedestrian stretch under the railway. 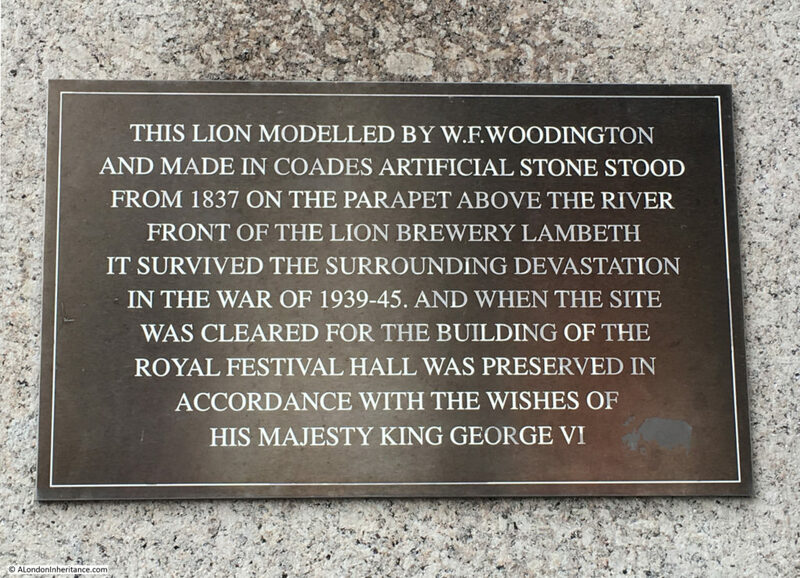 The Royal Festival Hall now fully occupies the site of the Lion Brewery between Belvedere Road and the Thames. The next photo is from the end of Sutton Walk and looking to the right along a short stretch of Belvedere Road. Behind the building we can see the top of the Shot Tower. 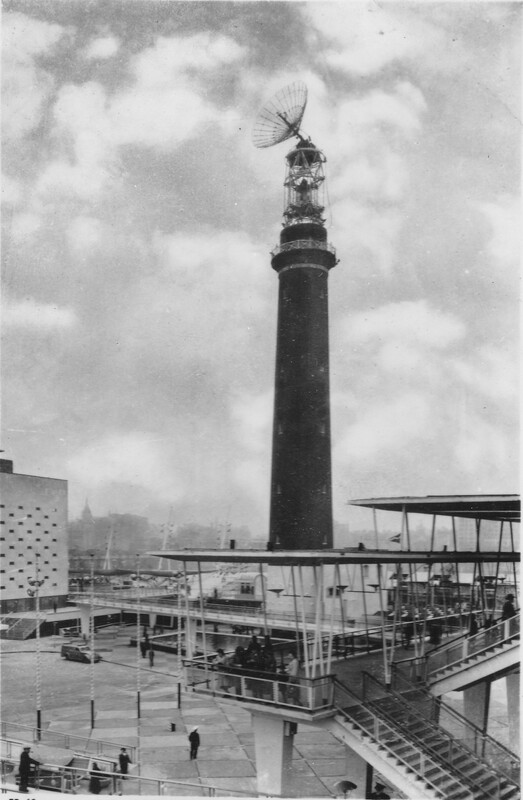 The top of the tower still in the original state prior to the modification for the Festival of Britain. The lettering on the wooden gate in the centre of the photo spells out the name of the London Waste Paper Company Ltd. After the brewery closed, the site was used for storage of waste paper by this company. Now we can cross over Belvedere Road and look back at the junction with Sutton Walk and we can see another part of the brewery with the same style of entrance arch, but still retaining the lion. This part of the brewery site contained warehousing and the stables. Also in the above photo, there is a pub on the right. There were several pubs along Belvedere Road as before the war, this was a very busy light industrial and residential area. 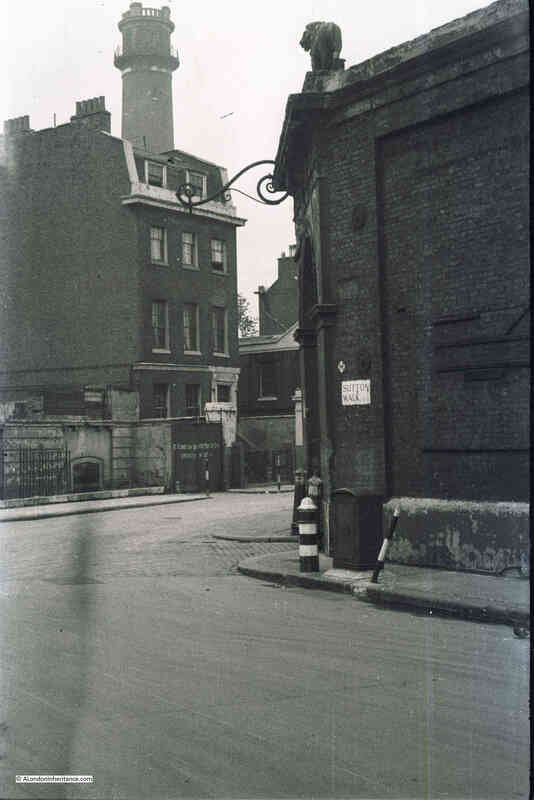 It looks still occupied, but when the photo was taken in 1947 this area had mainly been cleared and the pub would soon be demolished. And the same view in 2015. The building is the old Shell Centre Downstream building which is now “The Whitehouse”, one of the many office to luxury apartment conversions that now seem the norm across so much of central London. From extending the remaining stretch of Sutton Walk down to Belvedere Road, the lamp posts on the right in the two photos seem to be in exactly the same position. This is all that is left of Sutton Walk today, the short pedestrian stretch under the railway. The road running left to right is Concert Hall Approach, a new road (if you call more than 50 years old, a new road !! ), built as part of the redevelopment of the area. 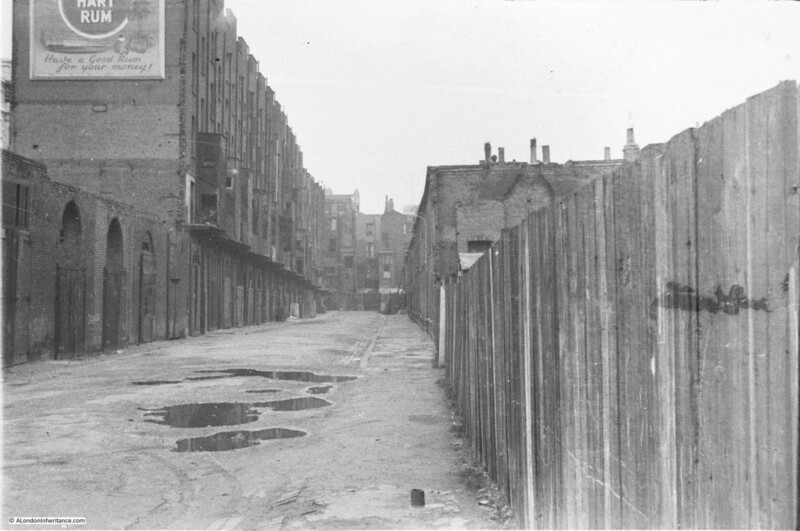 Although Belvedere Road was named after a house on the site of the Lion Brewery, a number of other roads in this area were named after Archbishops of Canterbury (no doubt due to Lambeth Palace, the London residence of the Archbishop of Canterbury being not that much further along the Thames). Sutton Walk was named after Charles Manners-Sutton (Archbishop between 1805 and 1828). 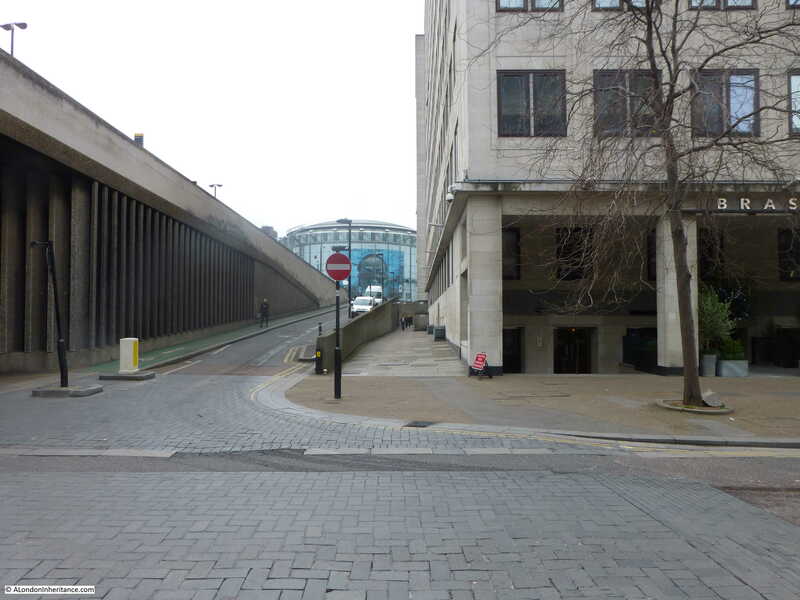 The nearby Tenison Street, (see the 1940 map, next street up towards Waterloo Bridge, lost during the construction of the Shell buildings) was named after Thomas Tenison (Archbishop from 1694 to 1715). 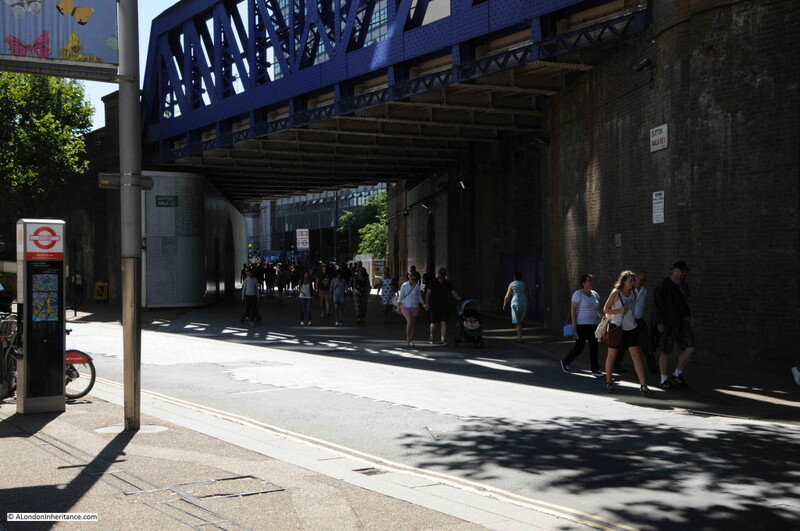 Although the street is not named in either the 2015 or 1940 maps, the street that runs from the corner of County Hall towards Leake Street is Chicheley Street. This street is still there and is named after Henry Chichele (Archbishop from 1414 to 1443). 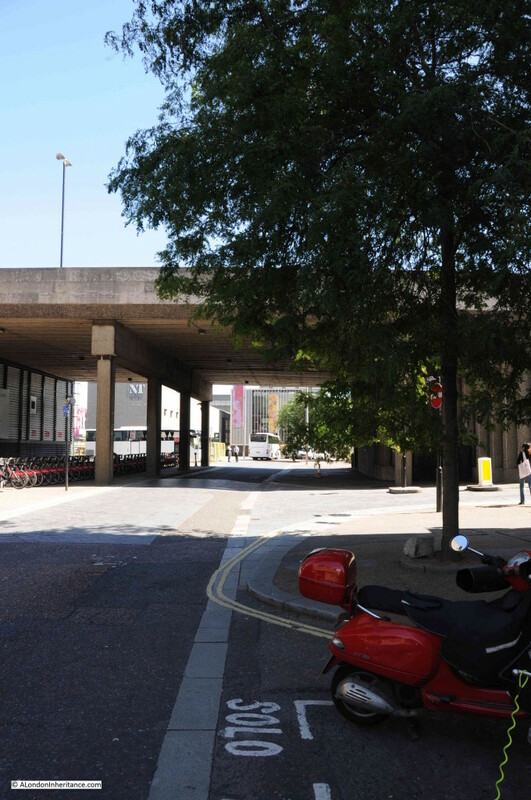 Although the current Waterloo Bridge was built in the early 1940s and opened in 1945, it still used the original approach road and the arches over the roads on the southbank. To confirm that this is indeed the location, look to the right of the above photo and part of a street sign can be seen. This is Howley Terrace and using the 1940 street map, Howley Terrace can be seen running parallel to the Waterloo Road as it runs up to the bridge (and continuing the street name theme, Howley Terrace was named after William Howley, Archbishop from 1828 to 1848 – this also provides a good estimation of when these streets were named, probably around1848 as William Howley is the last Archbishop to have a street named after him in this area). The naming of streets after Archbishops extended beyond the area between York Road and Belvedere Road. 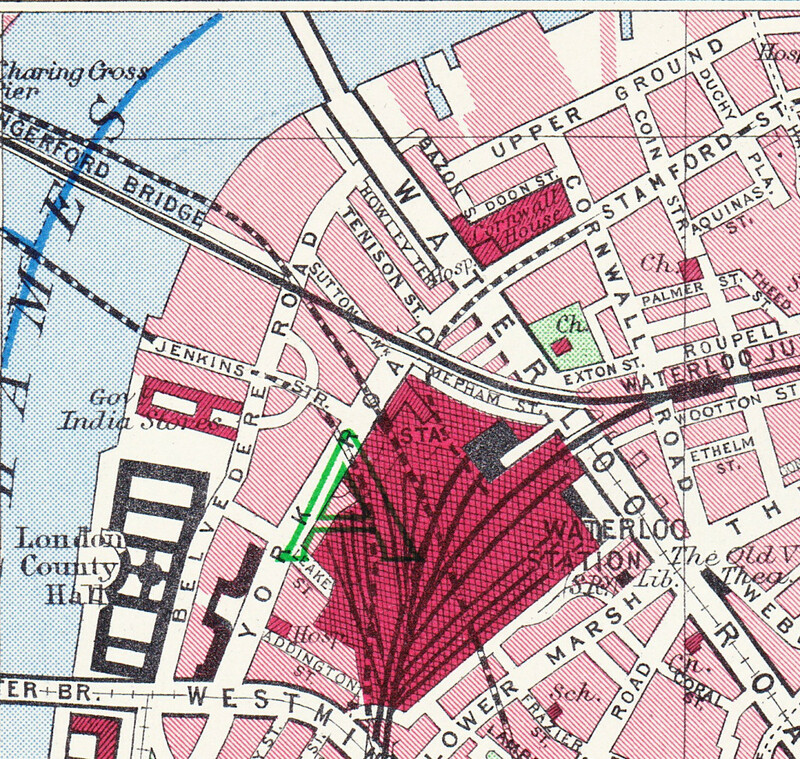 The street in front of Waterloo Station, Mepham Street (seen in the above 1940 map and still in existence) was named after Simon Mepeham, Archbishop of Canterbury from 1329 to 1333). The history of the church appears to be written across this area of Lambeth. The view is very different now. The new approach road to Waterloo Bridge, built as part of the redevelopment of the area provides a very different crossing of Belvedere Road. There is still a road turning off to the right. This is now a slip road down from the roundabout at the end of the road to Waterloo Bridge, down to Belvedere Road. Unlike Sutton Walk, the slip road does not appear to have any name, therefore the name Howley Terrace looks to be consigned to history. I find the Southbank fascinating. 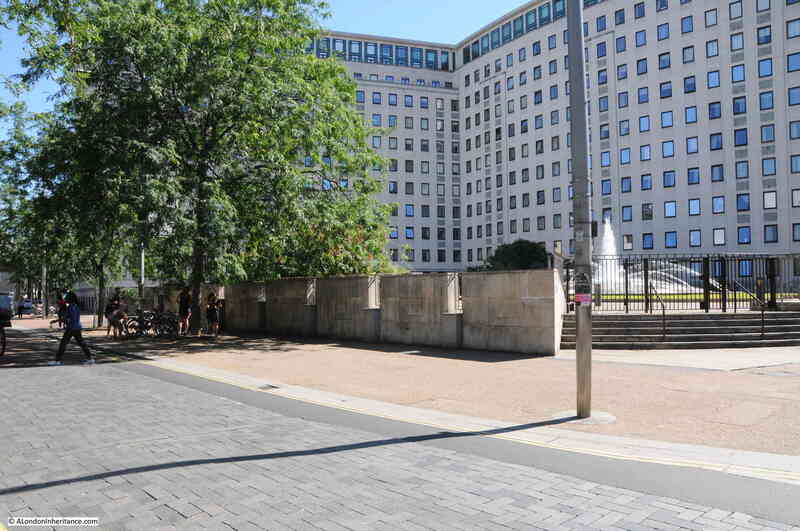 It is one of the areas in London that has undergone such significant post war development that there are very few traces of what was there before. 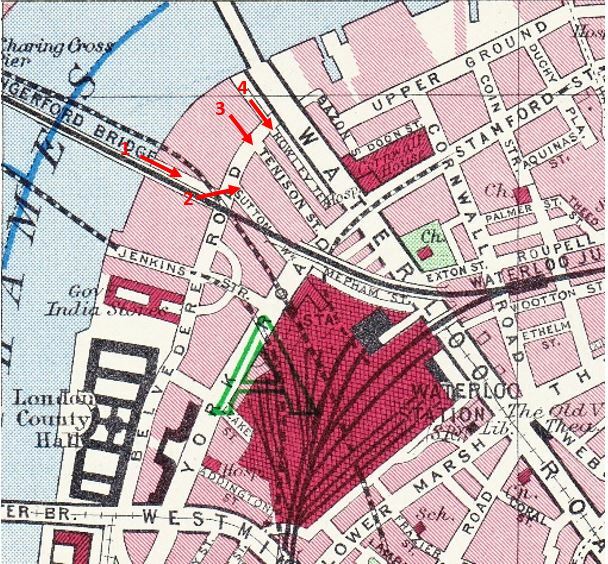 The railway running up to Hungerford Bridge is the only remaining structure that has survived, but it is good that some of the streets can still be found, even though, as with Sutton Walk, it is now a shadow of its former state. 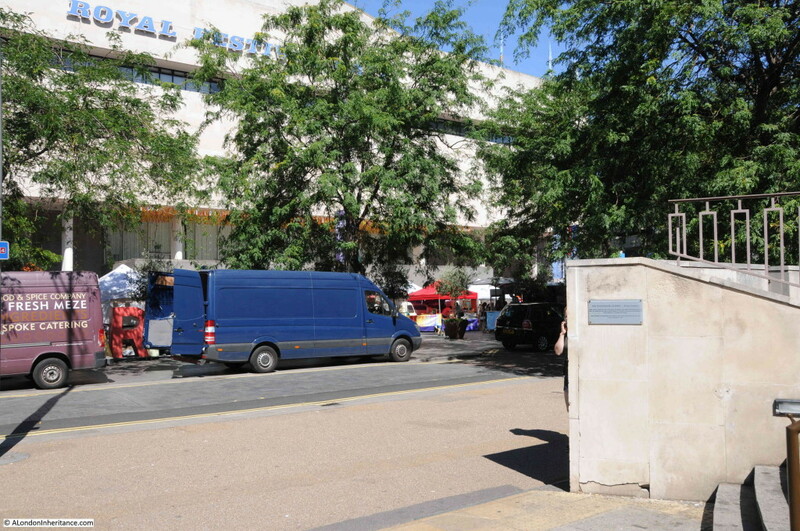 This entry was posted in London Streets and tagged Belvedere Road, Lion Brewery, Royal Festival Hall, Southbank, Sutton Walk on August 16, 2015 by admin. I recently scanned some of my father’s photos which included the last photos he took in the early 1950s of the Royal Festival Hall. 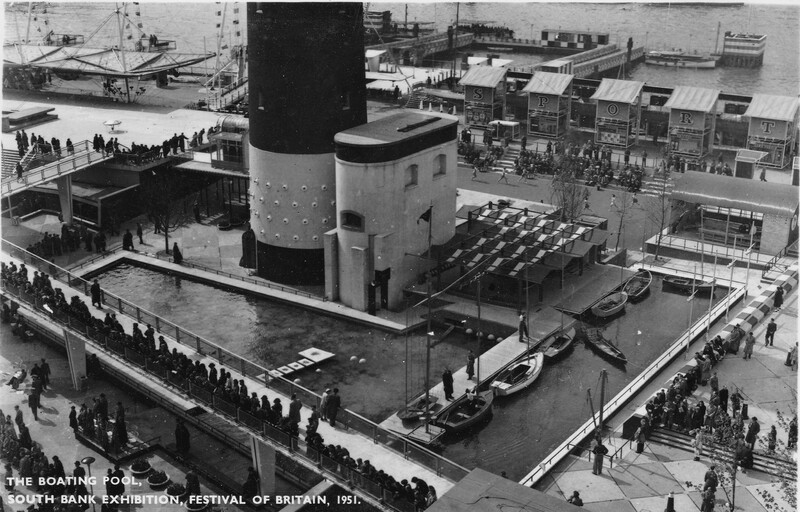 These photos show the area soon after the closure of the Festival of Britain when much of the infrastructure for the Festival was still in place. At the end of this post I have put together a time sequence of photos of the site from 1947 through to 2015 showing the original site, during construction and photos taken in the early 1980s and 2015. But first, the recently scanned photos, the first is of the Royal Festival Hall taken soon after closure of the Festival of Britain exhibition, from the footbridge alongside the Hungerford Railway Bridge. 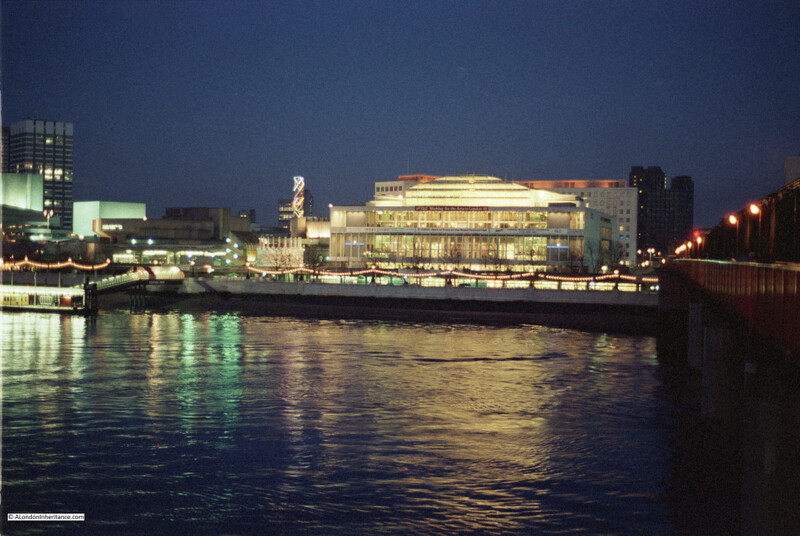 The overall shape of the Royal Festival Hall is exactly as it was when first built, however there have been a number of cosmetic changes to the front with the middle tier window line now stretching across the full front of the hall and changes to the top tier with a balcony now between the glass and the front of the hall. I planned to take the 2015 photo before the trees had come into leaf as when the leaves are fully grown the trees considerably obstruct the view of the hall. I was not early enough! Please do not get me wrong, we do not plant enough trees, within the city and across the country, however there are some places where trees are in the wrong position. The Royal Festival Hall is, in my view, one of the very few buildings constructed soon after the last war that works well architecturally and is in the right location. 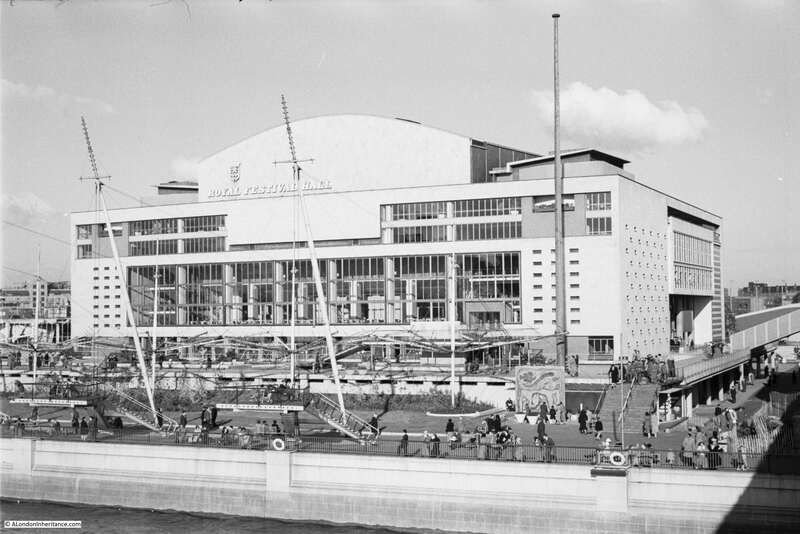 The Royal Festival Hall was always designed to be seen from and across the River Thames and to provide views along to the City. 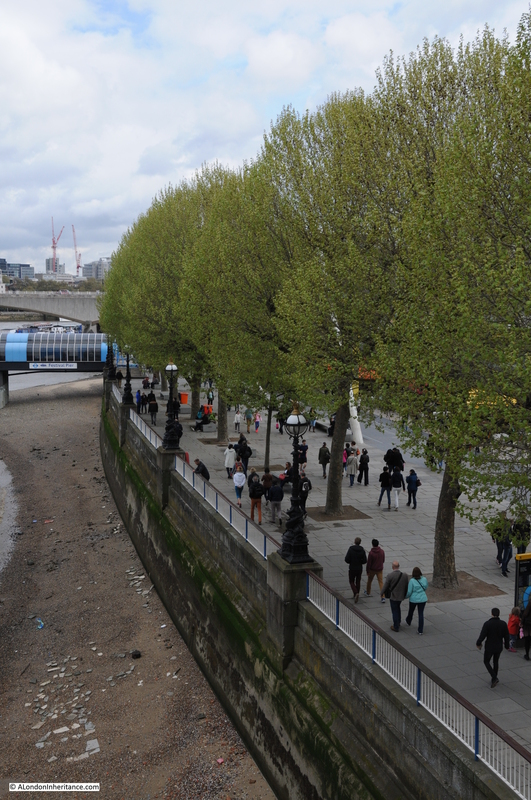 The trees in front of the building considerably obscure the building from the walkway across Hungerford Bridge and from the north bank of the Thames. 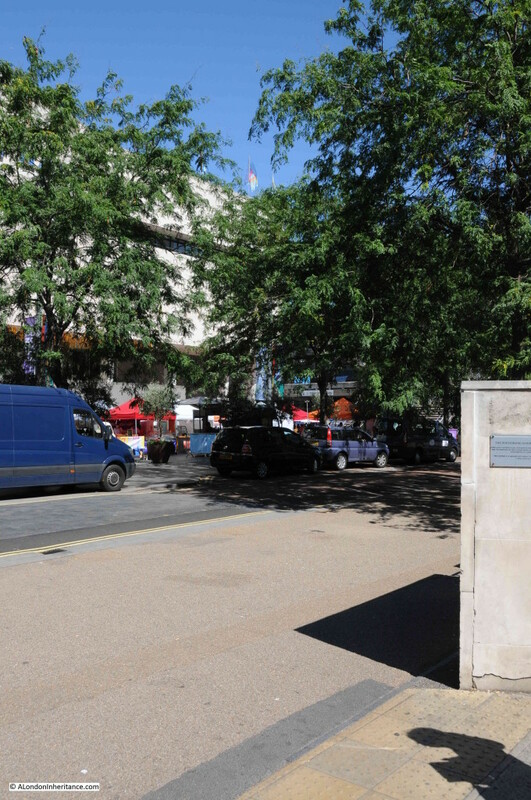 Note also how in the original photo the Royal Festival Hall did not have any buildings in the background to detract from the view of the hall. A very different situation in 2015. To the right of the hall is the building that was the downstream building of Shell Centre, but has now been converted from offices to apartments. To the left is the Kent House Tower above the London TV Studios and behind that with the crane on the top is the South Bank Tower, again another building being converted from offices to apartments. 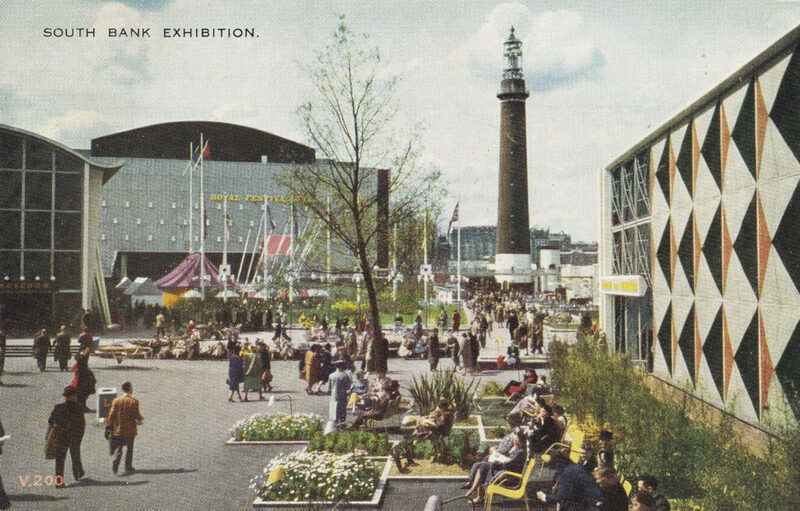 The poles are part of the decoration from the Festival of Britain. The photo also shows the observation platforms which I have heard of, but not seen photos of until scanning these negatives. There were six of these raised platforms extending just over the river wall and must have been a fantastic place to sit and view the surroundings. At the far right of the photo is the Shot Tower, to the left can just be seen the walkway to the river pier, and in the distance is an excellent view over towards St. Paul’s Cathedral. 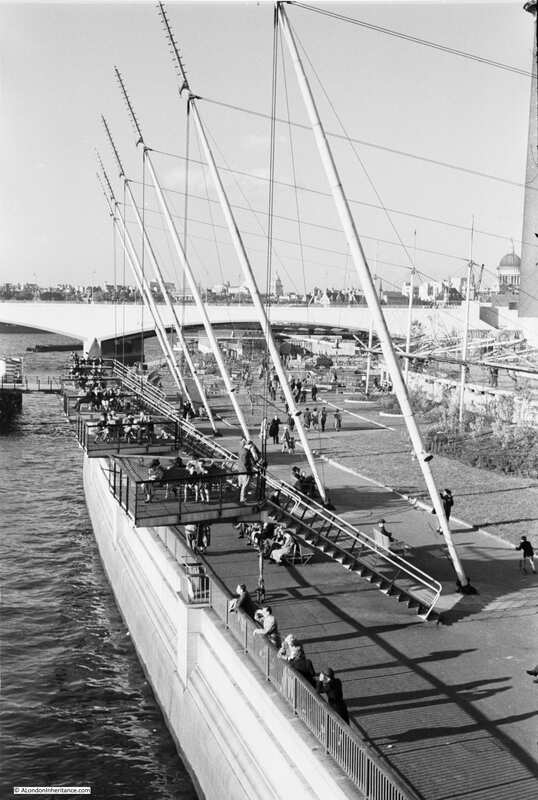 The observation platforms are unfortunately long gone, and later replicas of the poles that can be seen in the original photo are just visible, however the view is considerably obstructed by the trees. 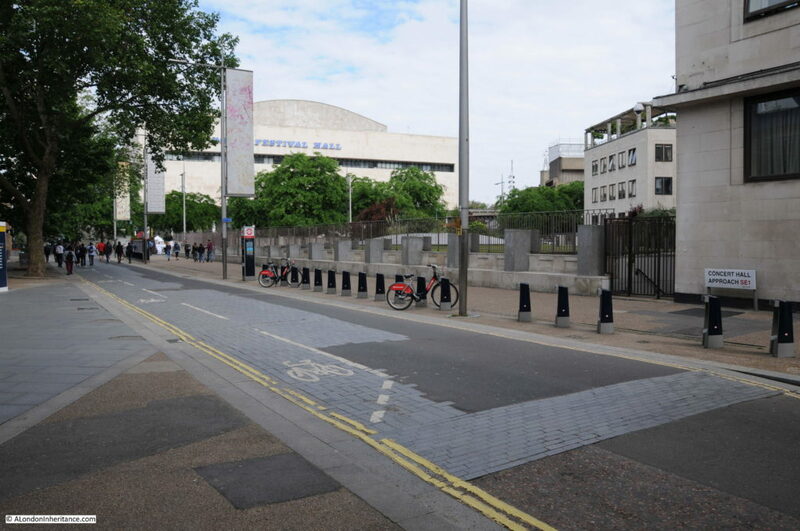 Again, an example of why I would argue that this area of the Southbank is the wrong place for trees and their removal would open up both the view of the Royal Festival Hall and the views along the river and to the city. During the Festival, the Shot Tower had a Radio Telescope aerial mounted on the top. I had always assumed this was for decoration only, however the Festival Guide explains that it was a fully working system that would bounce radio signals off the moon, allowing visitors to see the time delay between the transmitted and reflected signal. The aerial system was mounted on a redundant gun mounting which could be moved to allow the aerial to track the moon. “The Tower has been one of the landmarks of London since it was built-in 1826. It remains the only old building on the site, to serve as a beacon for the Festival. It is a beacon in two senses: it is a modern lighthouse with a double flashing beam welcoming visitors as far as 45 miles away when the weather is clear; it is a radio beacon directing radio signals to the moon and beyond into space. The lighthouse mounted at the top will flash from sunset to Exhibition closing time. It has a power of 3 million candles. It is of the most modern all-electric design and so takes up far less space than the older types which needed weighty lenses to intensify the beam. The light itself comes from a lamp of three thousand watts; an automatic device ensures that a second lamp can swing into position should it fail. This lighthouse optic is the work of Chance Brothers Ltd., who made all the glass for the original Crystal Palace a hundred years ago. This was 64 years ago and I wonder if our public demonstration of science has progressed much since. The following is from the Festival Guide and shows the detail of the top of the Shot Tower. 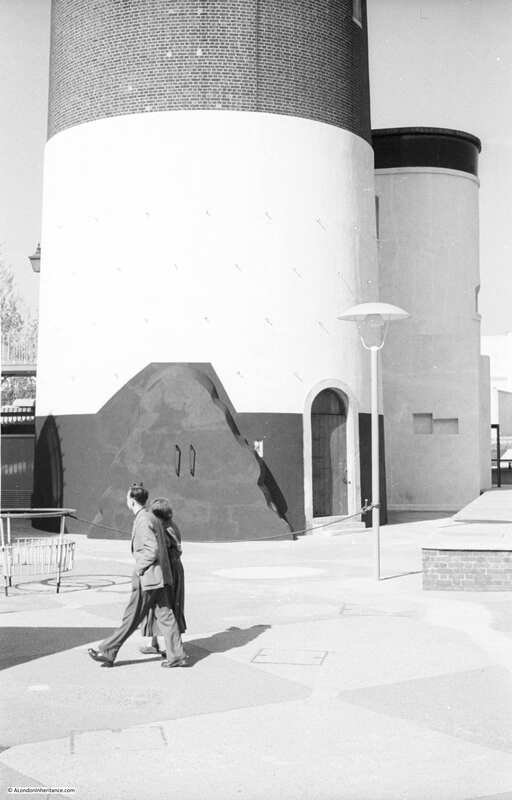 As with the observation platforms, it would have been good if the Shot Tower could have been preserved as part of the Southbank’s history. 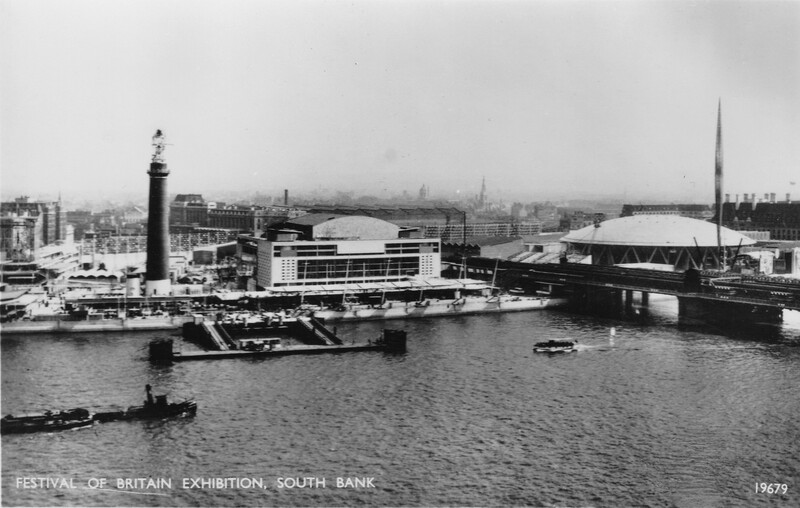 This was at the far eastern end of the Festival Hall site (Waterloo Bridge can just be seen at the lower right). The numbers on the central arch are the years 1851 and 1951. 1851 was the year of the Great Exhibition held in the “Crystal Palace” in Hyde Park. This structure looks to be a very rough approximation of the original Crystal Palace building. Both exhibitions had a very similar theme to demonstrate the country’s strength in industry and science. I have featured this area of the Southbank in a number of posts to highlight different periods in the development of the site. I have brought the photos taken by my father and myself together in the following sequence to show how the site has changed from 1947 to 2015. 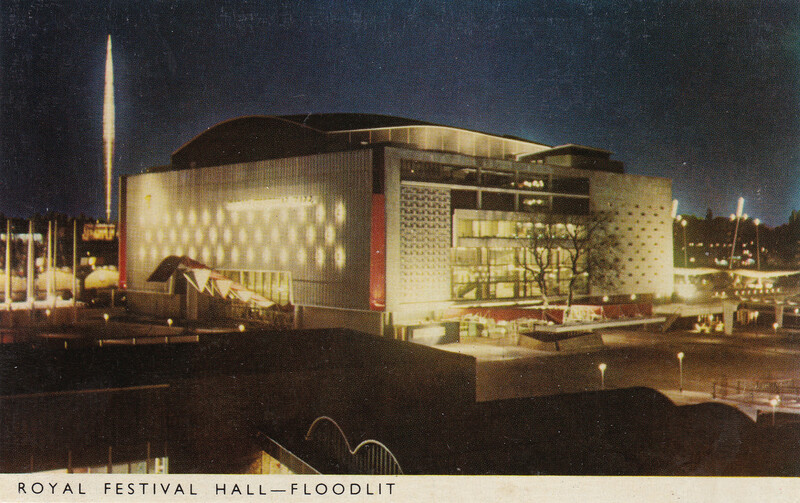 The guidebook to the Festival in the section on the Royal Festival Hall explains that it is a work of art in itself and “the superb dramatic effects of space and vista, within the building and beyond it to the river and the city“. With the way that London is growing, the opportunity to appreciate space and vista at ground level is diminishing. 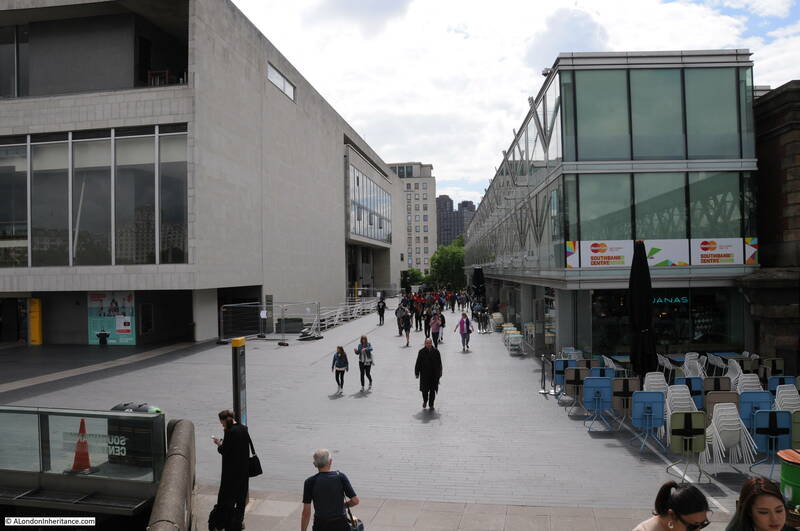 It would be good if the area in front of the Royal Festival Hall could be opened up again to meet the original intentions of the architects. 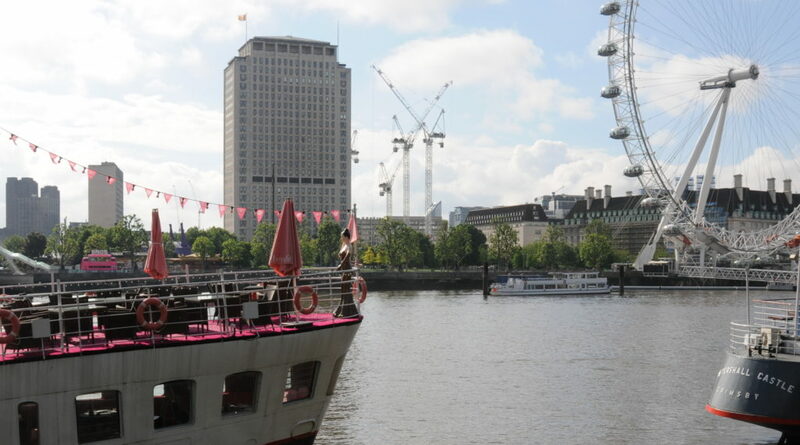 This entry was posted in London Buildings and tagged Lion Brewery, River Thames, Royal Festival Hall, Shot Tower, South Bank on May 3, 2015 by admin.